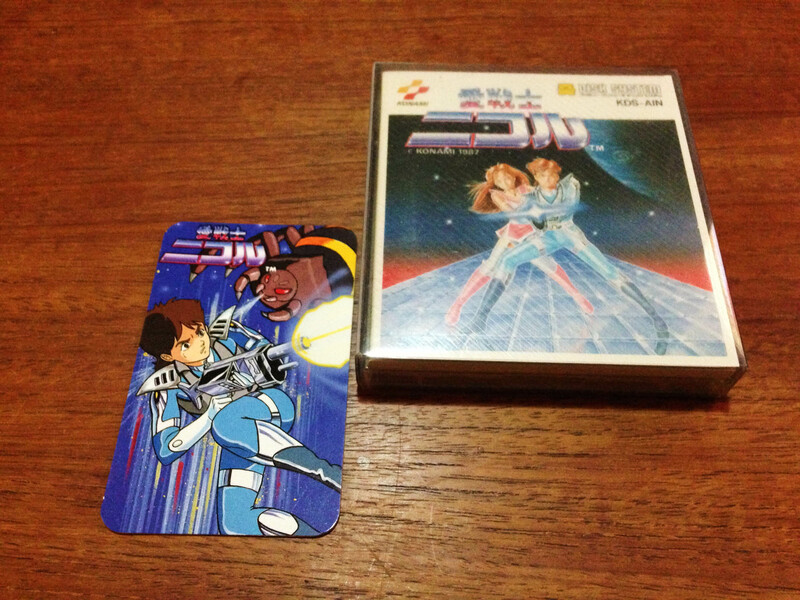 Famicom Disk System – Nintendo Sega Japan! 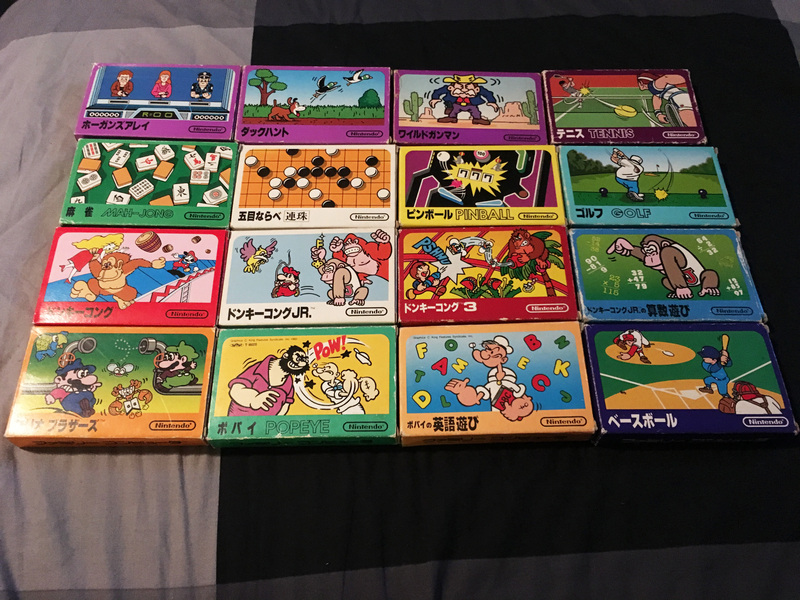 After a few years of working toward it, I’ve finally collected all the first party ‘small box’ Famicom games. 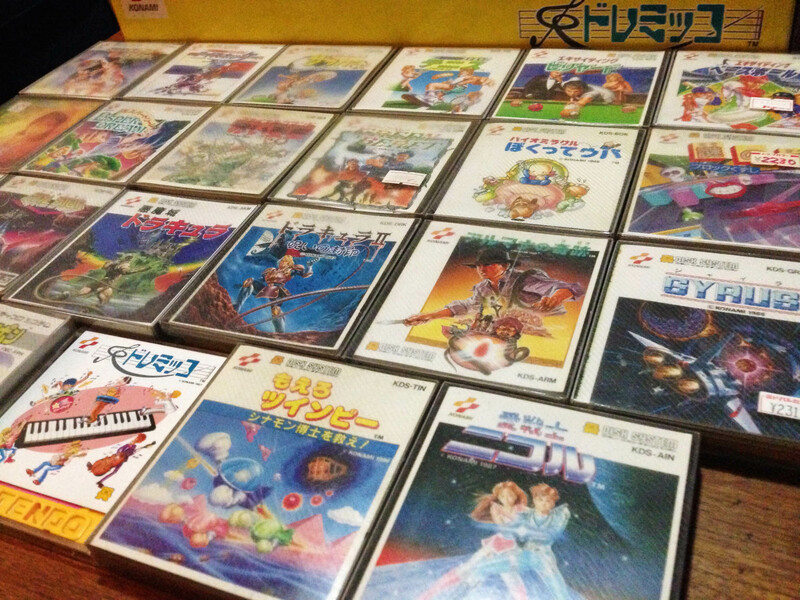 This is the first ever line of Nintendo console games, covering the Famicom’s 1983 launch through most of 1984. 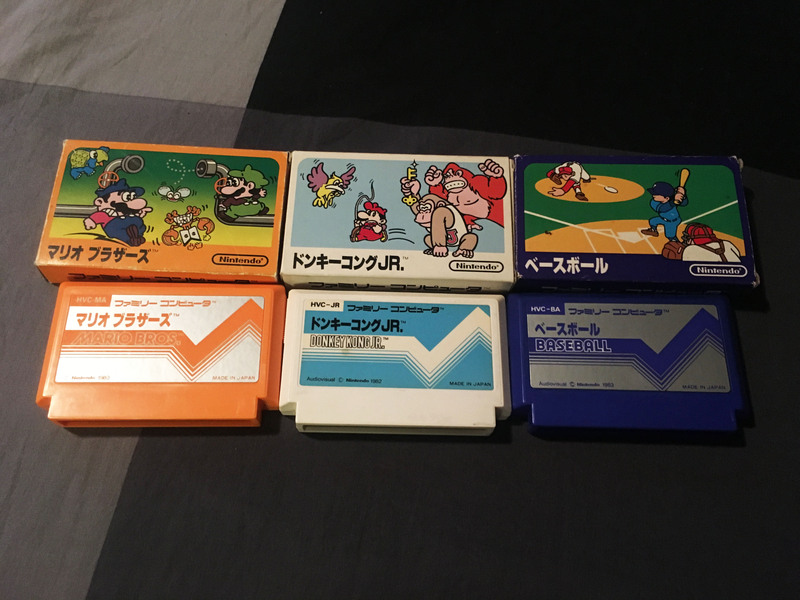 This set as a whole is often confused with the slightly smaller ‘pulse label’ games line, which features the pulse motif for the cartridge label on each game. This confusion is common because unfortunately everything doesn’t quite line up perfectly, design-wise. 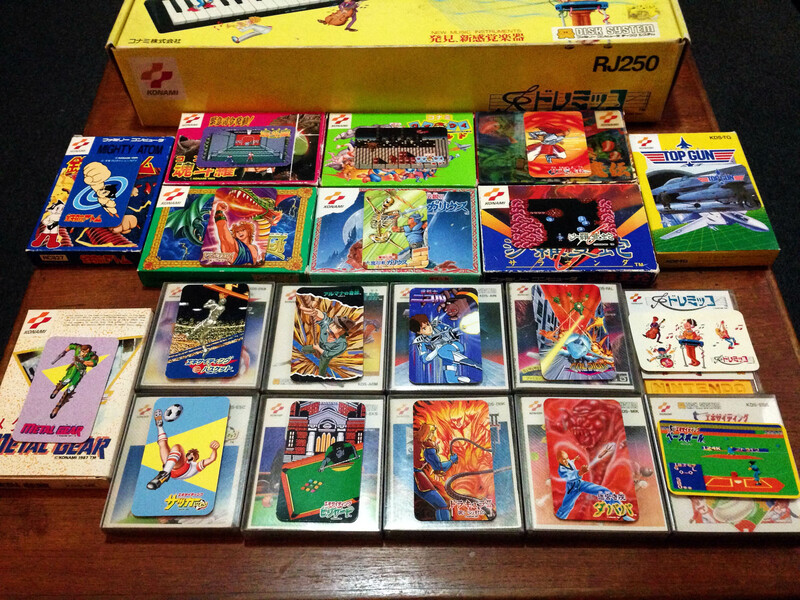 The small box set includes all pulse label titles except one (Devil World, which came in the later standard Famicom larger box). 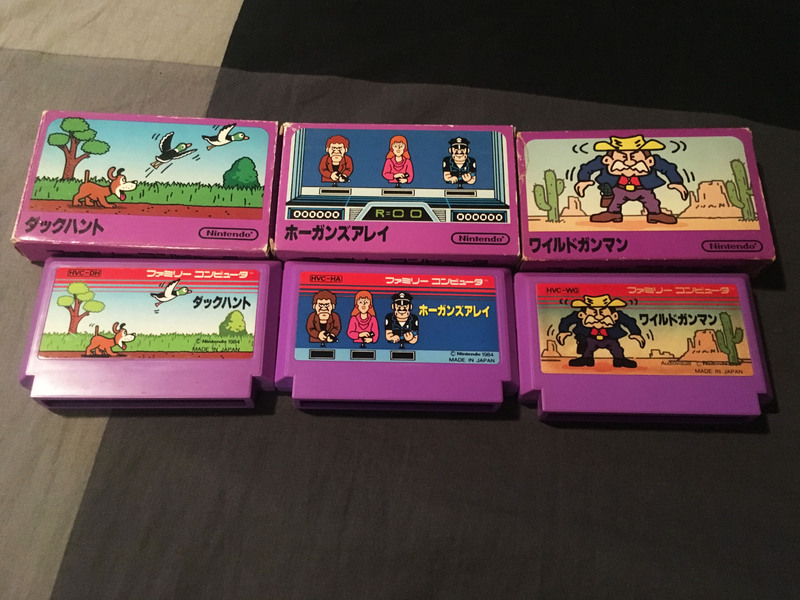 And all small box games are also pulse label titles, except for the three gun games – Duck Hunt, Hogan’s Alley and Wild Gunman, which have the cover illustration on the cart. So there’s the pulse line set, and the small box set, which almost completely overlap but unfortunately (for those with OCD) not 1:1. 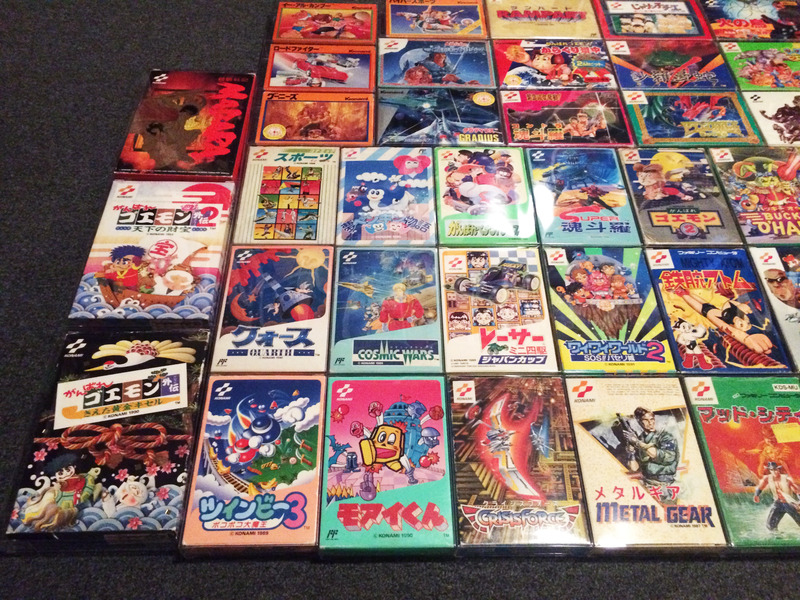 Of course, this is not all small box Famicom games, as many third parties’ initial lines came in the same size. 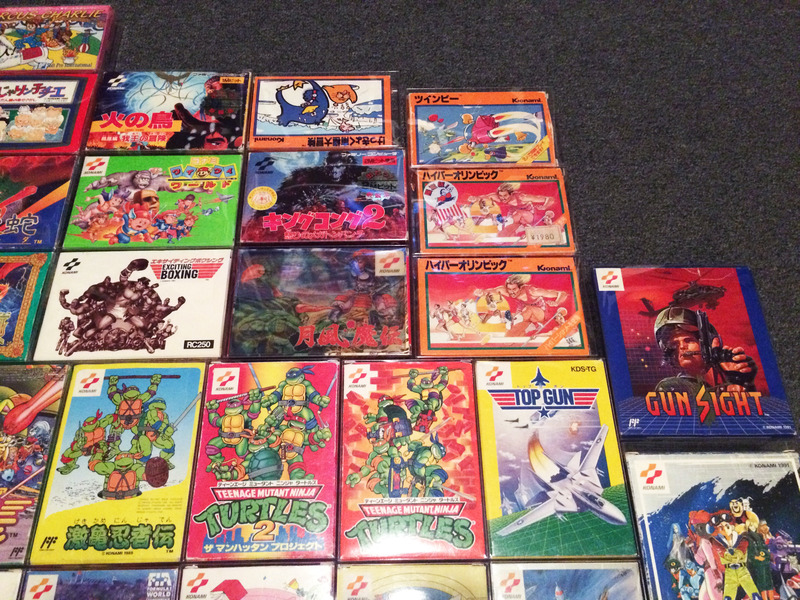 Here’s my Hudson, Taito, and Namco games added to my Nintendo set. 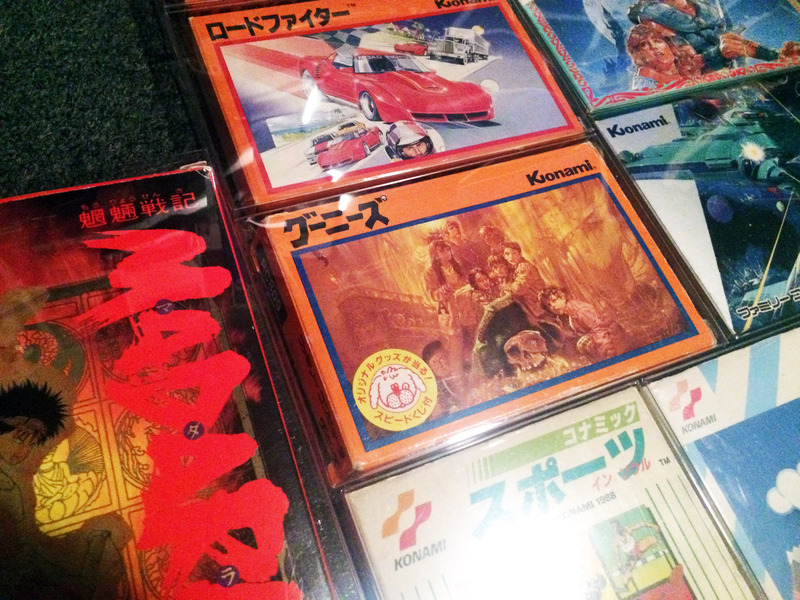 Interestingly, while Konami were there on the Fami in this era (1984), and they followed the initial Nintendo box design motif closely, they skipped the small box size and went straight to a medium size for their initial set of games, the Konami ‘orange box’ line. 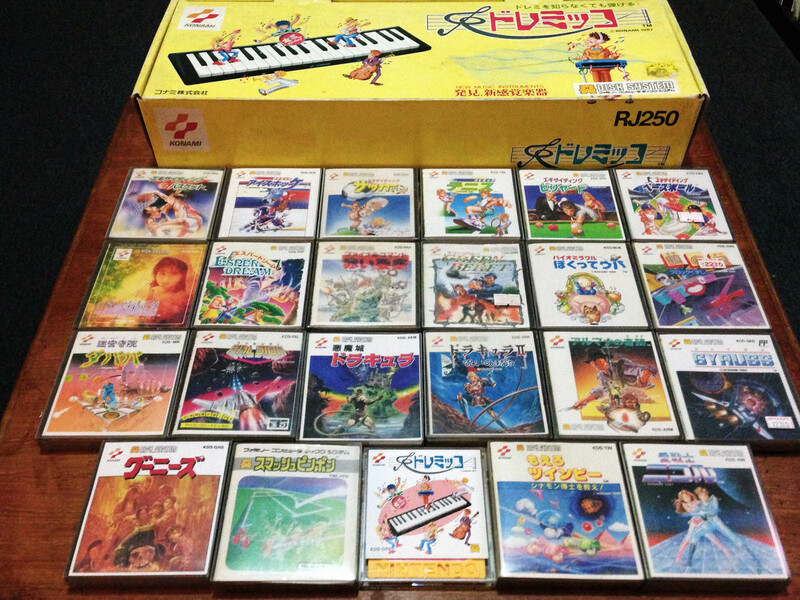 I charted the rest of the Konami Famicom box design evolution in this article. So what’s next? 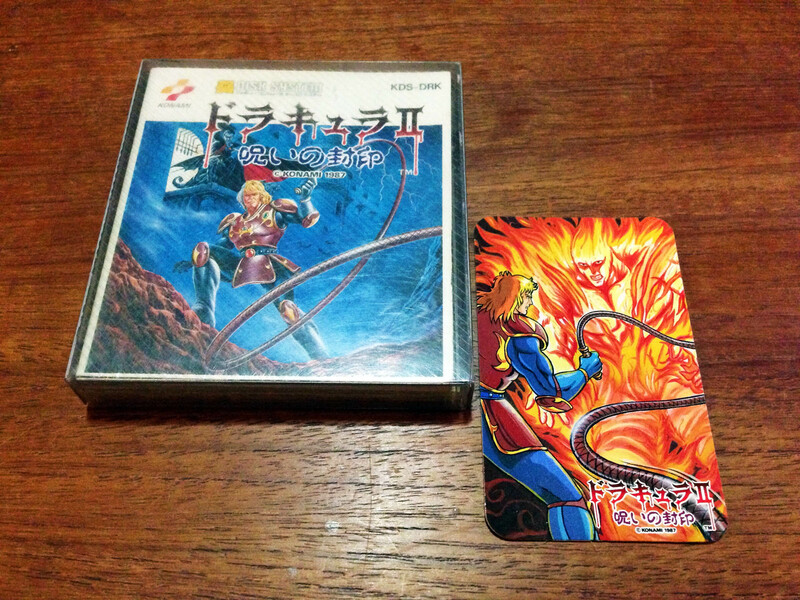 I guess I should get around to picking up Devil World to complete the pulse label set, for one. 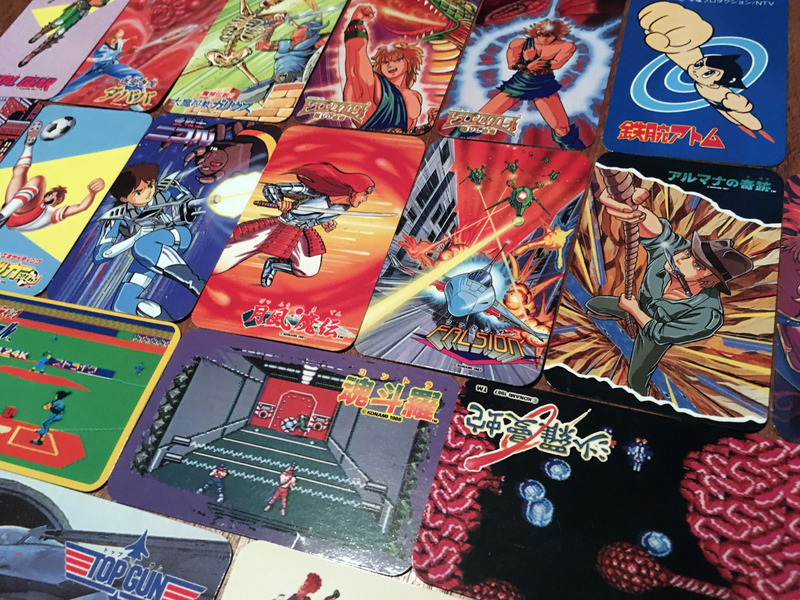 Another update on this article on my now never-ending quest to collect a series of Konami Famicom character cards from the 80s. 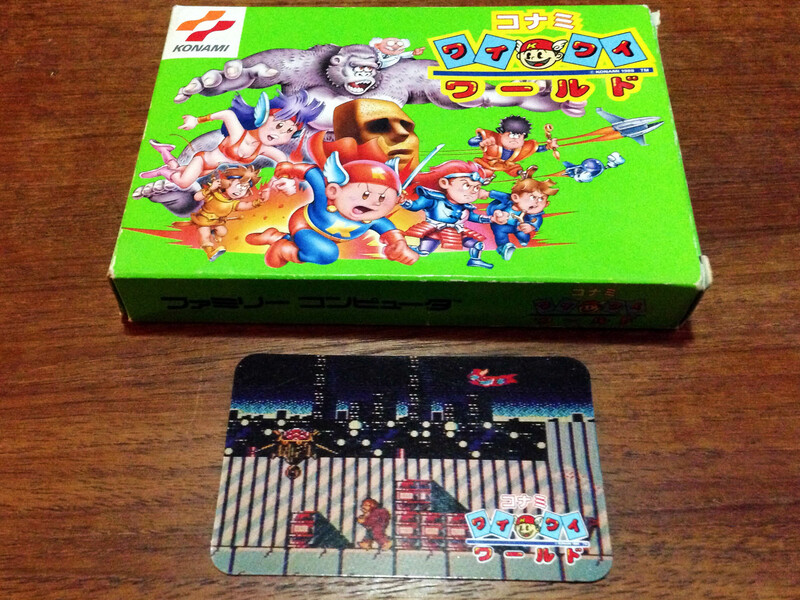 Recap: at some point starting in 1987, Konami decided to include a collector card with all their Famicom titles. 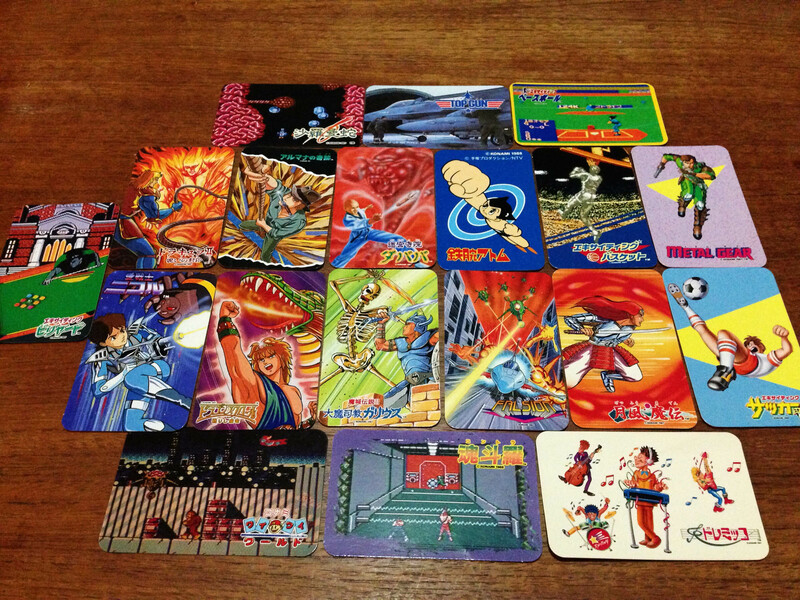 Each card had an illustration related to the game; some cards featured screenshots or pieces of screenshots, others had artwork of scenes in the game. 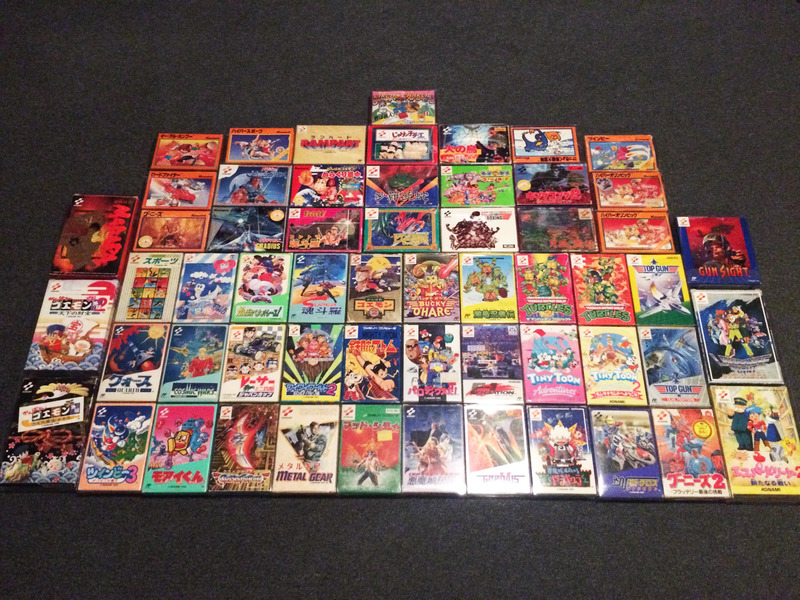 Last time I decided I was done, having collected a card for 19/20 of the games which came with a card. 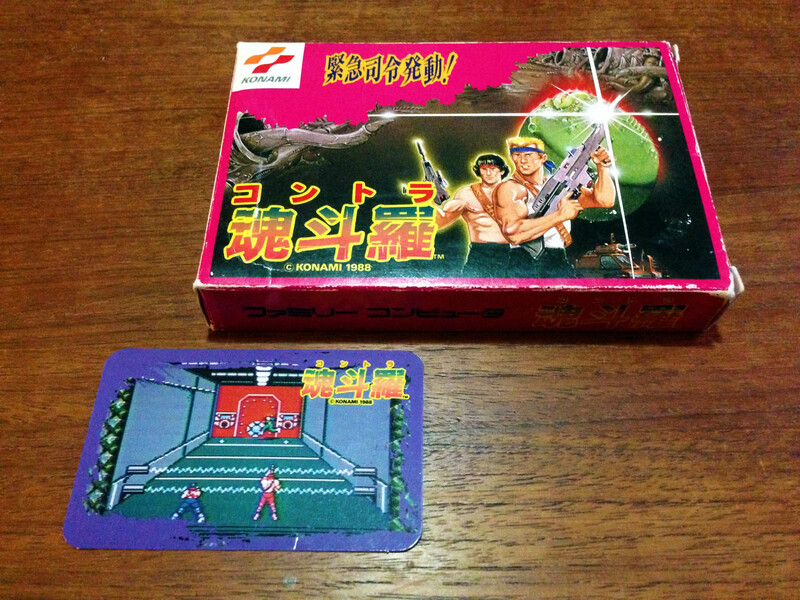 The missing game was Exciting Boxing (エキサイティングボクシング), which while I’d managed to get a hard-to-find boxed copy of it to complete my complete boxed Konami Famicom collection, I’d never seen one with a card outside of complete large box copies which come with a novelty inflatable controller and cost a fortune when they appear. 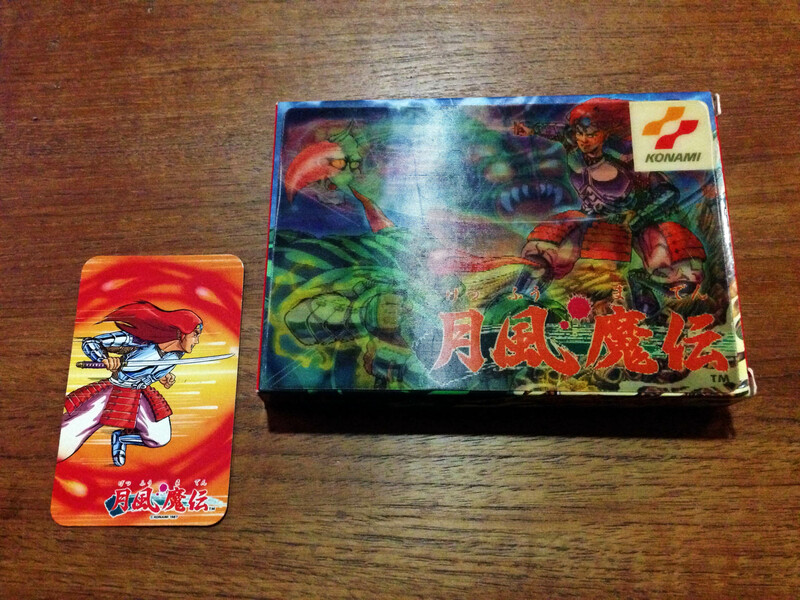 But one lucky day I found a regular small boxed game with the card. 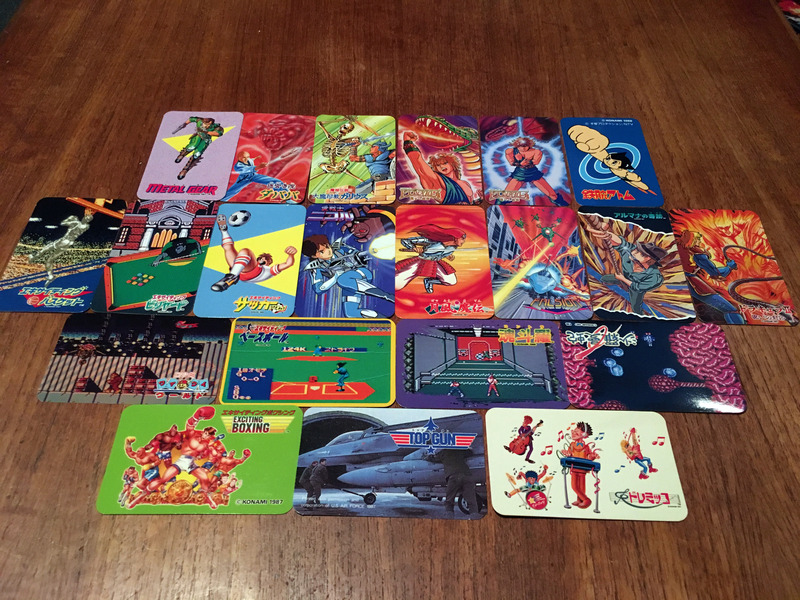 And now I have a card for all twenty of the games that came with one! 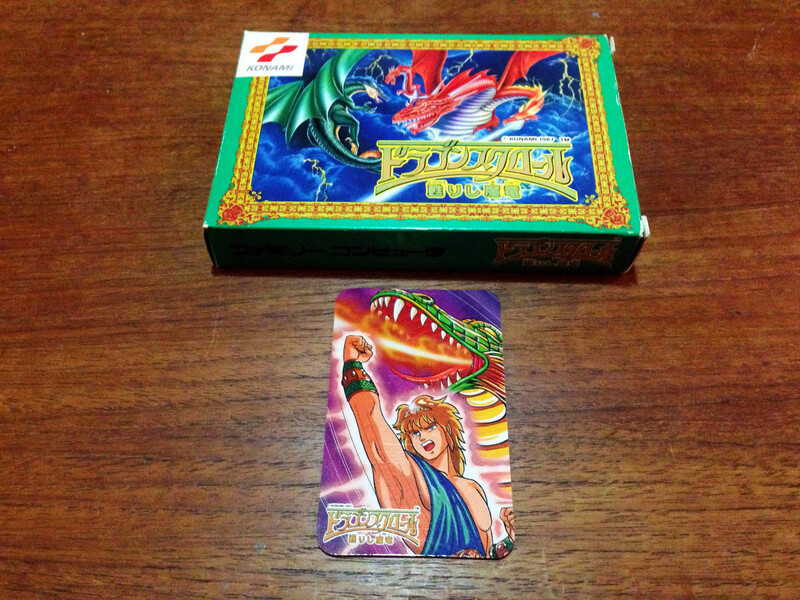 On top of this, I picked up a beautiful near mint copy of Dragon Scroll (ドラゴンスクロール) in Ikebukuro, which came with a different card to the one I had, so now I have entered the murky waters of collecting multiple cards per game. 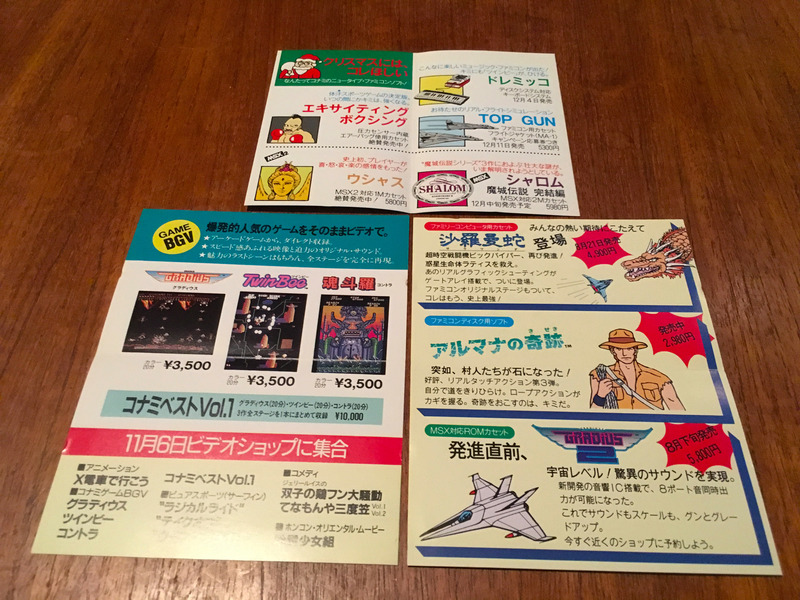 Dragon Scroll also came with these great advertisements for various Konami games and sountracks. Pretty cool when you have almost every item on a vintage ad! 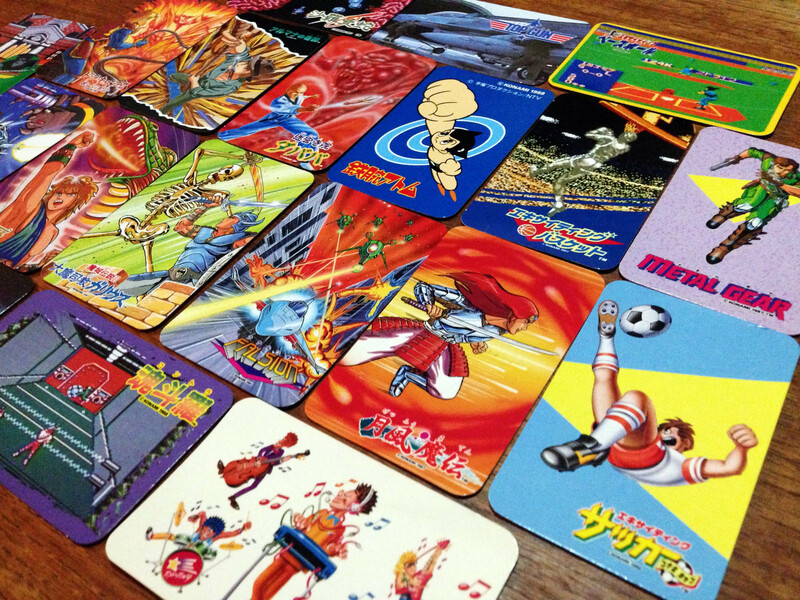 This Japanese site (which I found because it flatteringly used this site as a source) has nicely collated most of the available cards, so this journey may go for many more years. 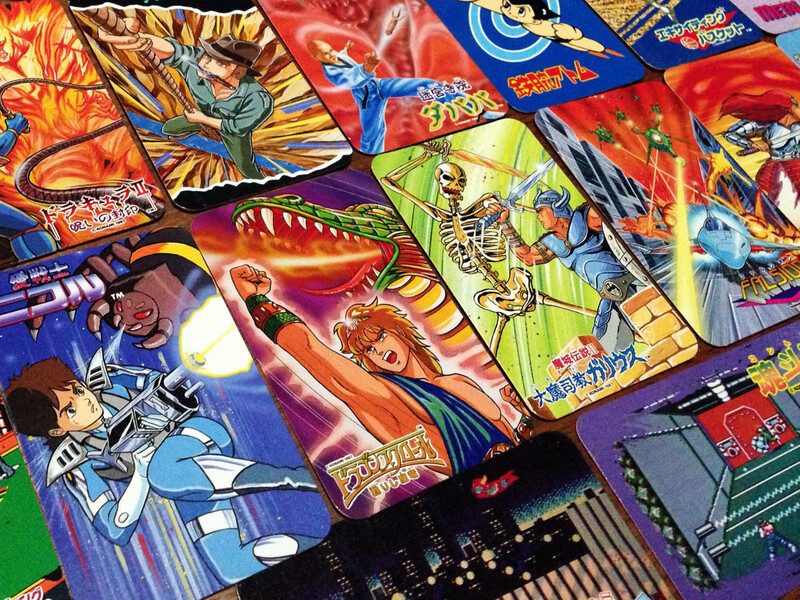 Another great site Video Game Den also has good info on the available cards. 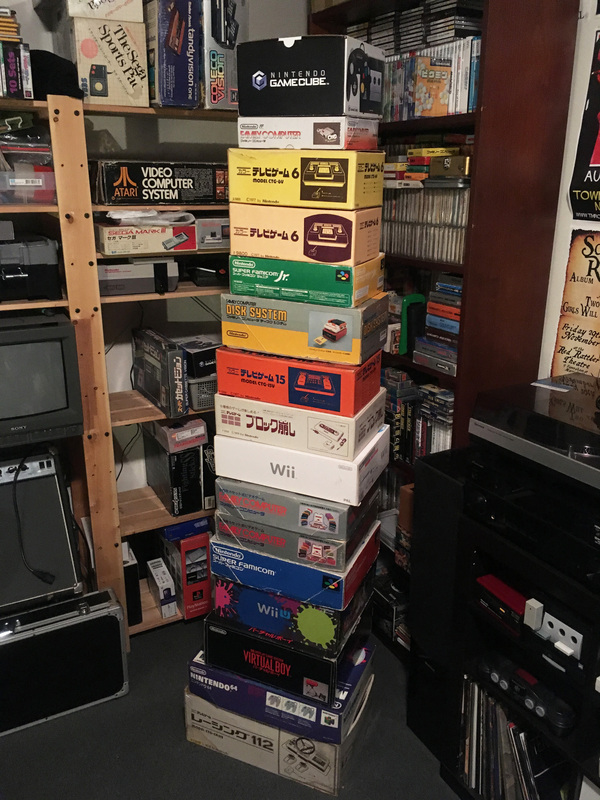 With my recent acquisition of a Color TV-Game Racing 112, My collection now includes almost every major revision of every Nintendo home console ever released, complete in box. A small confession: My Wii U is not a Japanese model. 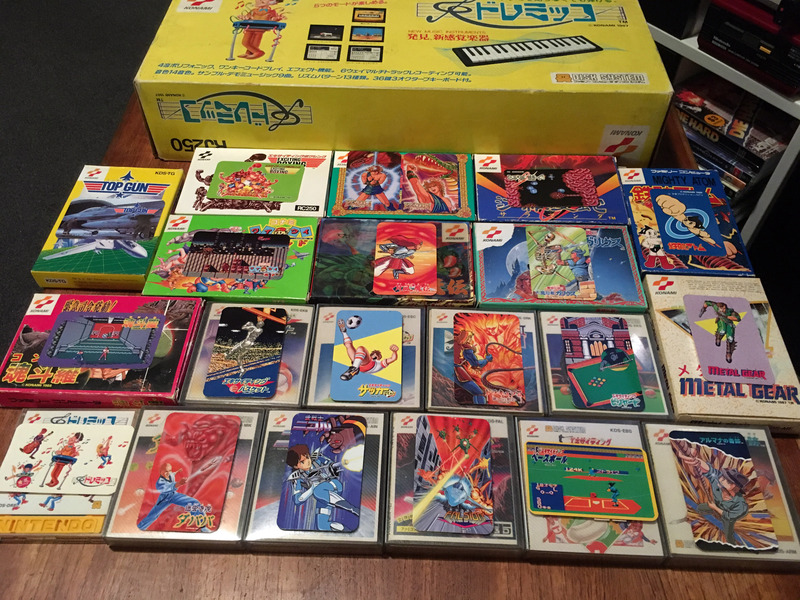 There were a few more minor revisions of the consoles along the way – FF logo/non FF logo Famicom, output changes, different coloured consoles of various sorts (even shapes like the Pikachu N64), but these are all the major Japanese revisions. 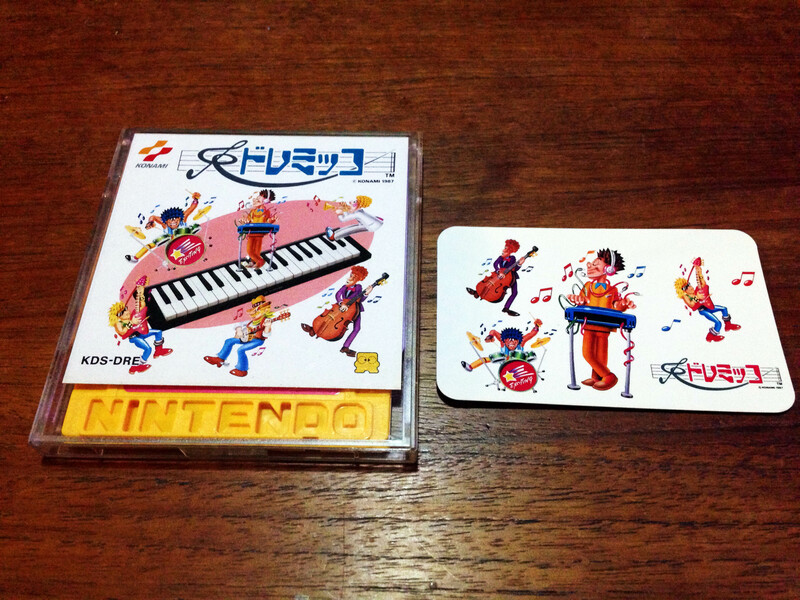 The Wii Mini revision was not released in Japan. 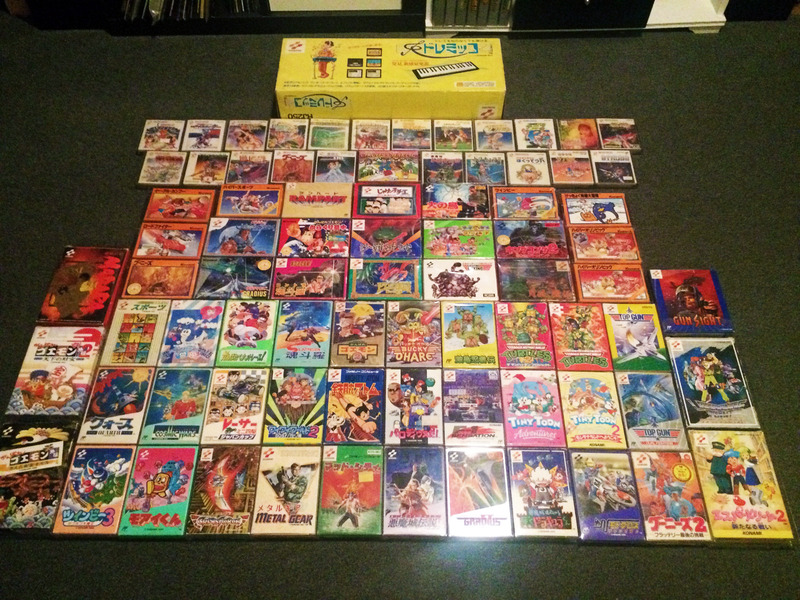 There’s one major item missing – the Computer TV-Game. I’ll almost certainly never get one of these. This ‘console’ is incredibly rare, insanely expensive, and its questionable if it was even a consumer product since it was literally an arcade game with TV out. 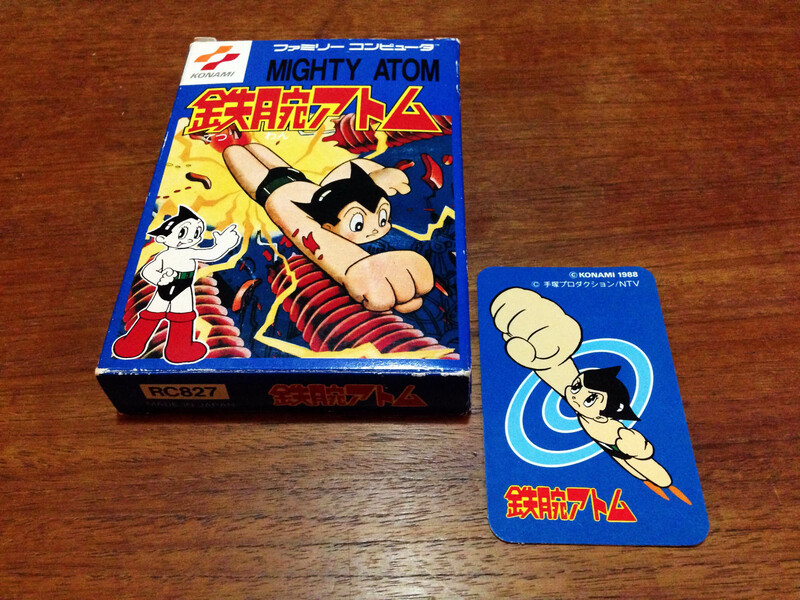 It sold for ¥48,000 in 1980. 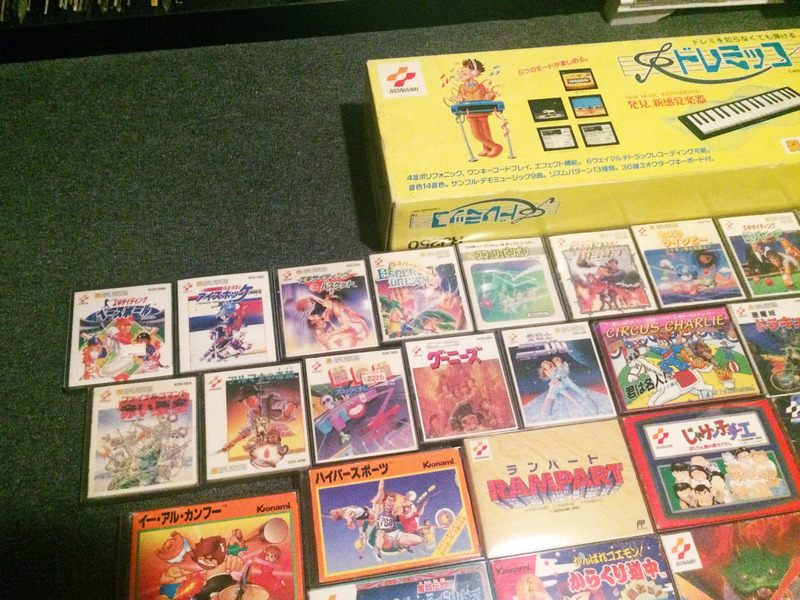 For comparison the Color TV Game Racing 112 was selling for ¥5000 in 1980, and the Famicom launched in 1983 for ¥14,800. 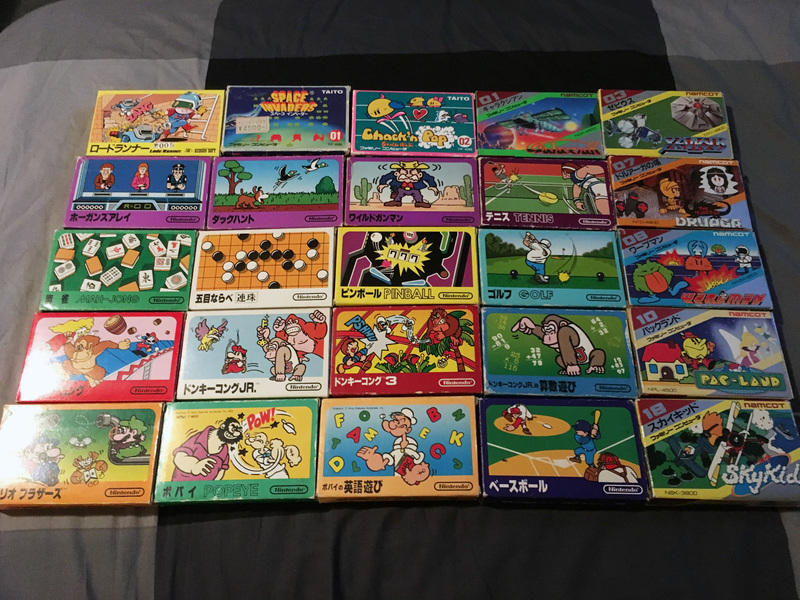 Following my complete Konami Famicom Disk System set, I have finally completed the other half of the full set, every Konami cartridge exclusive Famicom game. This set has taken over 20 years to complete. 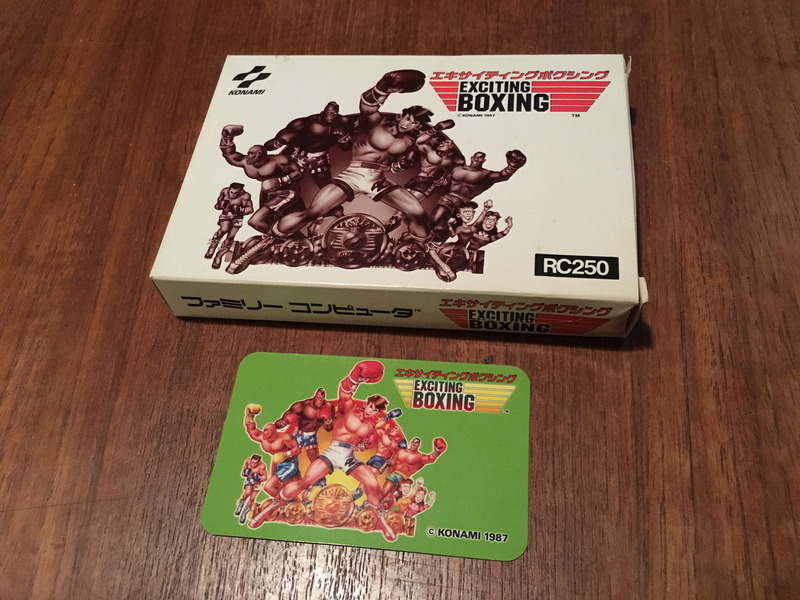 It was finally done when I managed to find a rare boxed copy of Exciting Boxing for a good price. 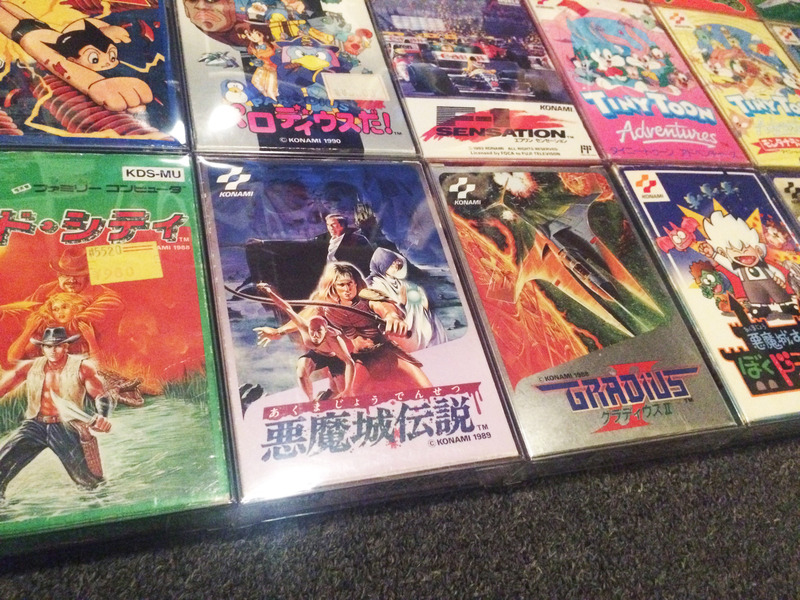 The first Famicom game I ever got was The Goonies, since it wasn’t released in the west and I loved The Goonies II. 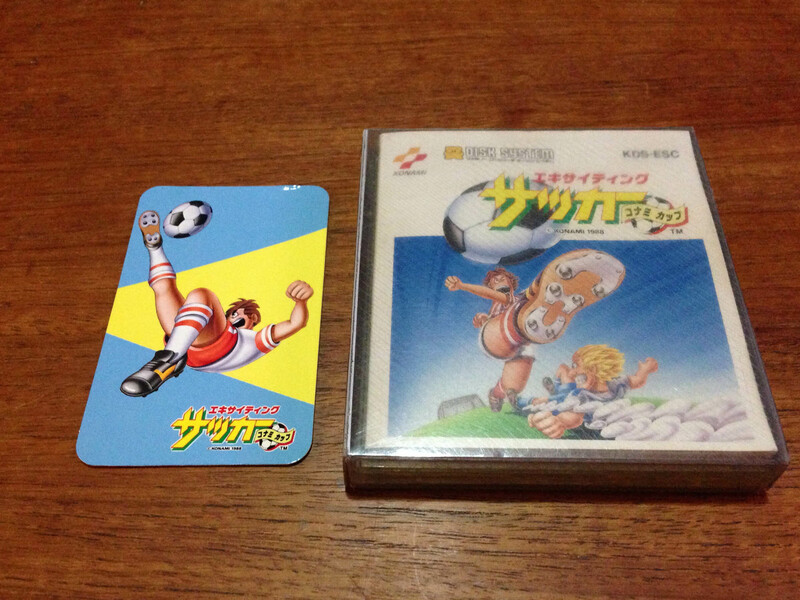 I originally played it on my NES via a converter, but it started my Famicom obsession. 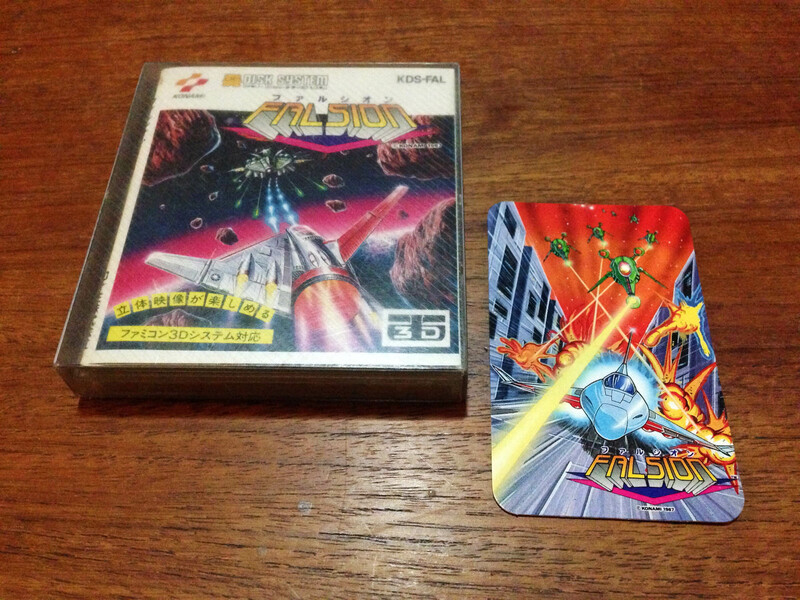 Another early pickup was Parodius Da. 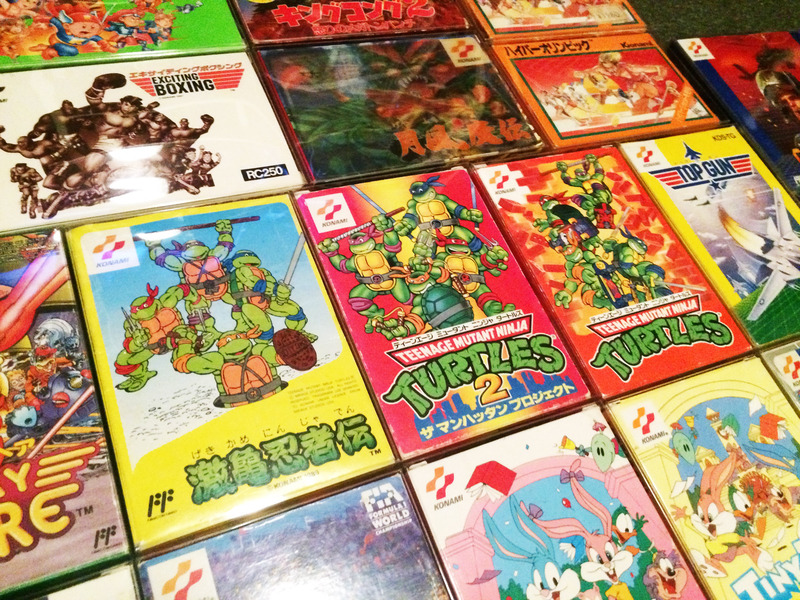 The rarest item is possibly Geki Kame Ninja Den (Legend of the Radical Ninja Turtles) – the Japanese version of the first Ninja Turtles game. 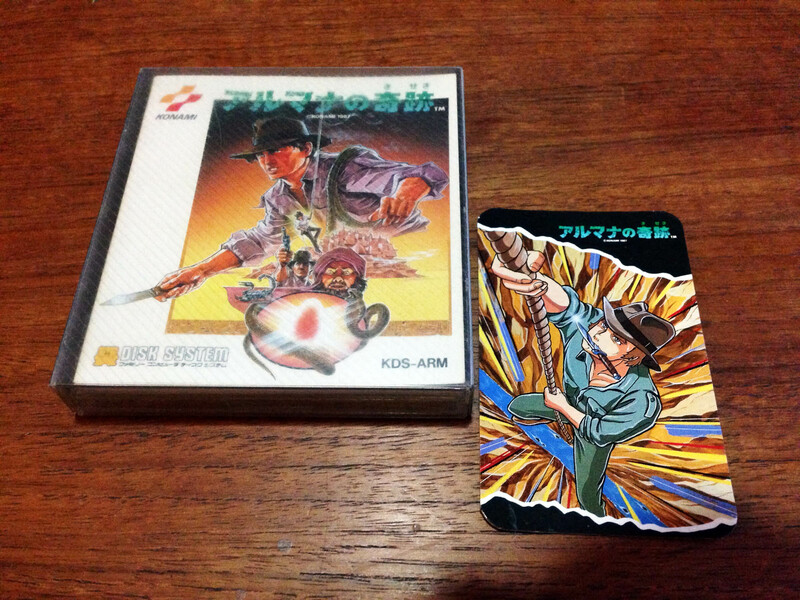 Or maybe the third party published Konami arcade game Circus Charlie. 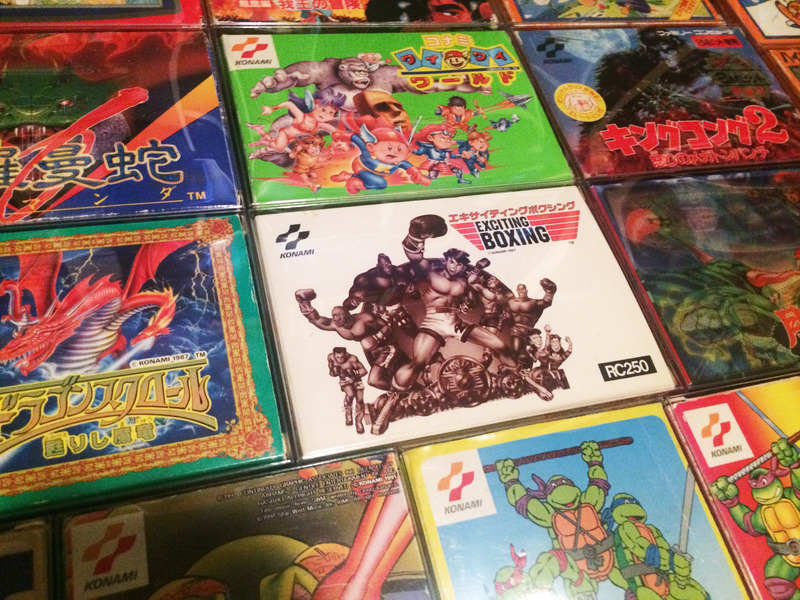 Most valuable could be Geki Kame Ninja Den, Bucky O’Hare or Exciting Boxing. 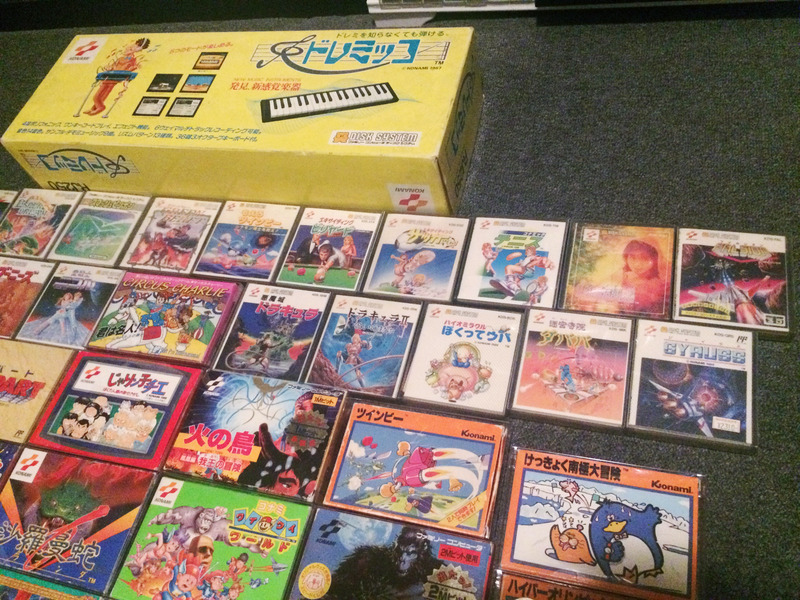 I don’t have the DoReMikko–style big box for Exciting Boxing, or the late-era cartridge re-releases of the FDS games Akumajou Dracula, Bio Miracle Bokette Upa, or Moreo Twinbee, so there’s a small amount of room to grow the set. 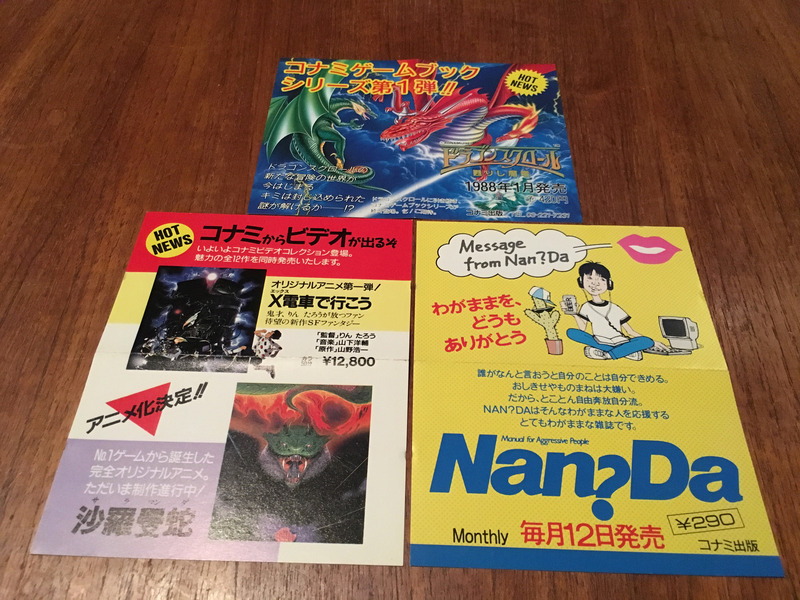 Unfortunately all four of those items are hilariously expensive. 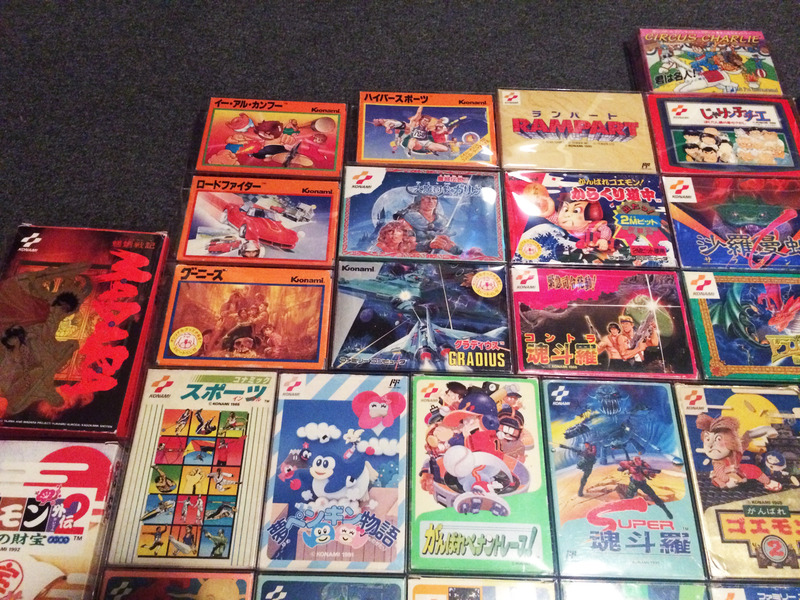 Here’s the full set with the Famicom Disk Games added to the photo, including the large DoReMikko box up the back. 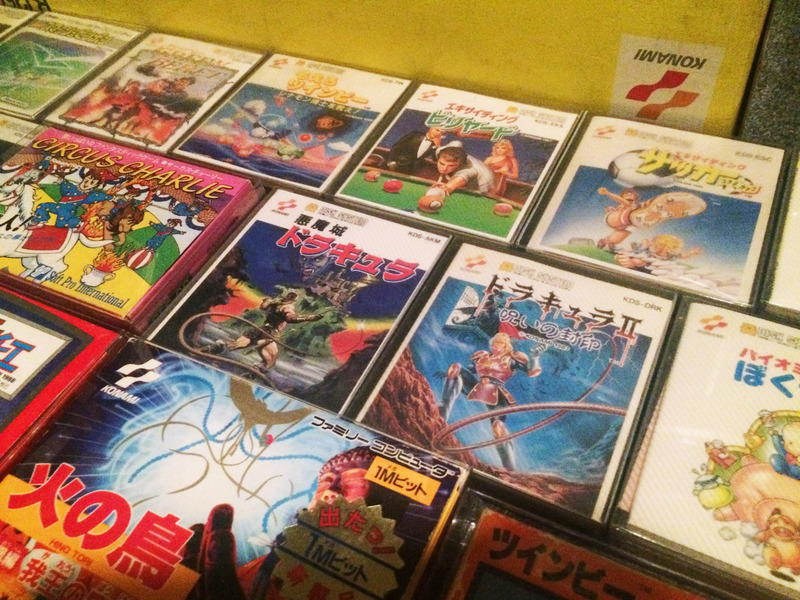 As for favourites, it’s pretty hard to go past the Contra games, Arumana no Kiseki, and Akumajou Densetsu. 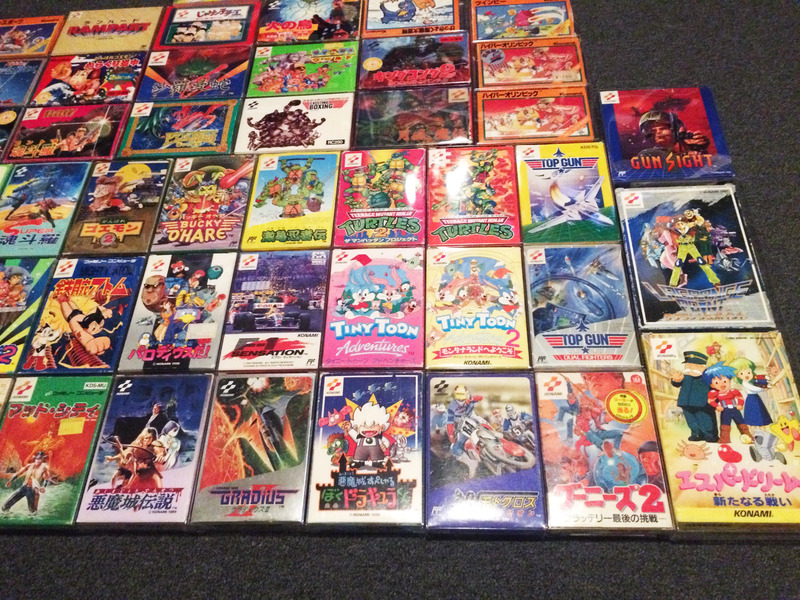 Also Akumajou Dracula, Ai Senshai Nicol, King Kong 2, Gradius II, Salamander, Crisis Force, Maze of Gallious, Wai Wai World 1 and 2, Tiny Toon Adventures 1 and 2, Bucky O’Hare, Metal Gear, Bio Miracle Bokutte Upa, Exciting Soccer, Exciting Basket, Ganbare Goemon 1 and 2, Meikyuu Jiin Dababa, Falsion, Dragon Scroll… so many classics. 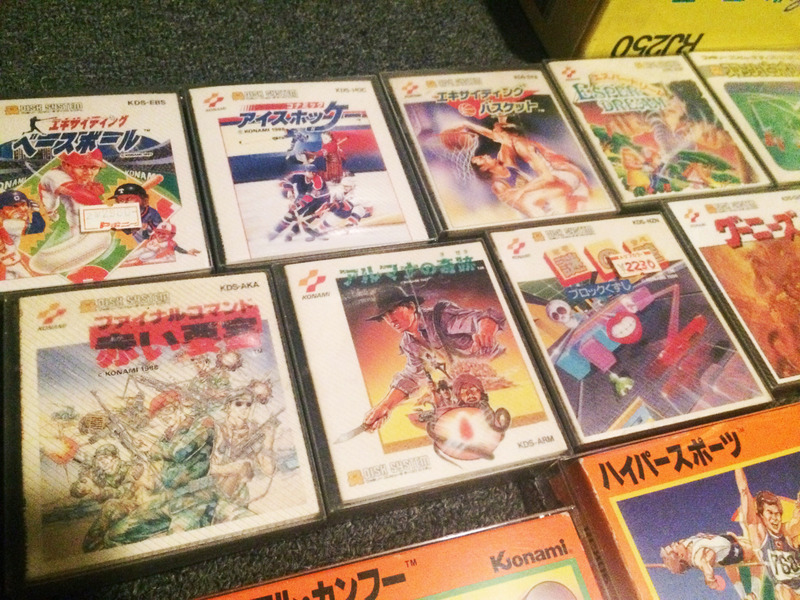 Konami were at their peak in this era, and I believe the single greatest developer in the world at that point. How the mighty have fallen. 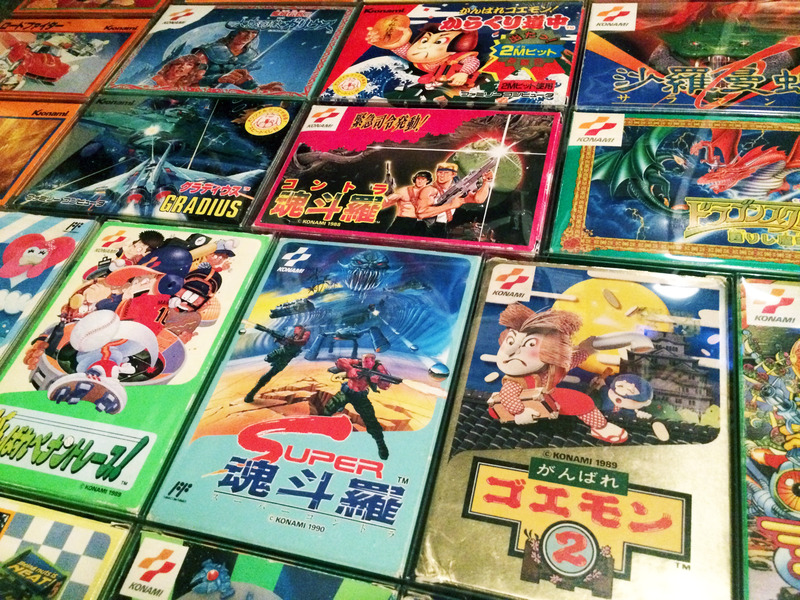 Quite a few Famicom games, in particular Famicom Disk games, came in very fancy packaging. Many came in large boxes with extra stuff like figurines, cassette tapes, large format manuals, and in some cases even more outrageous things, like Exciting Boxing‘s giant inflatable controller. 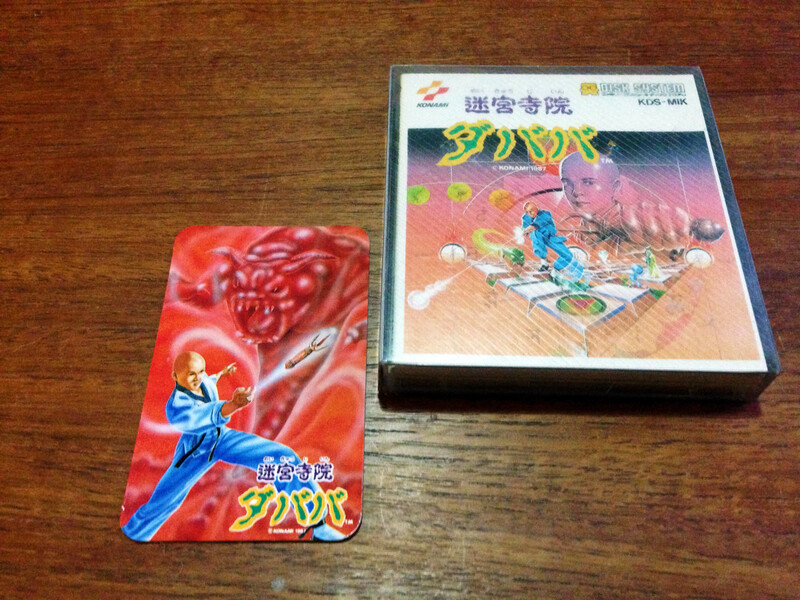 These are not like modern special editions, as in most cases these were the only release of the game. 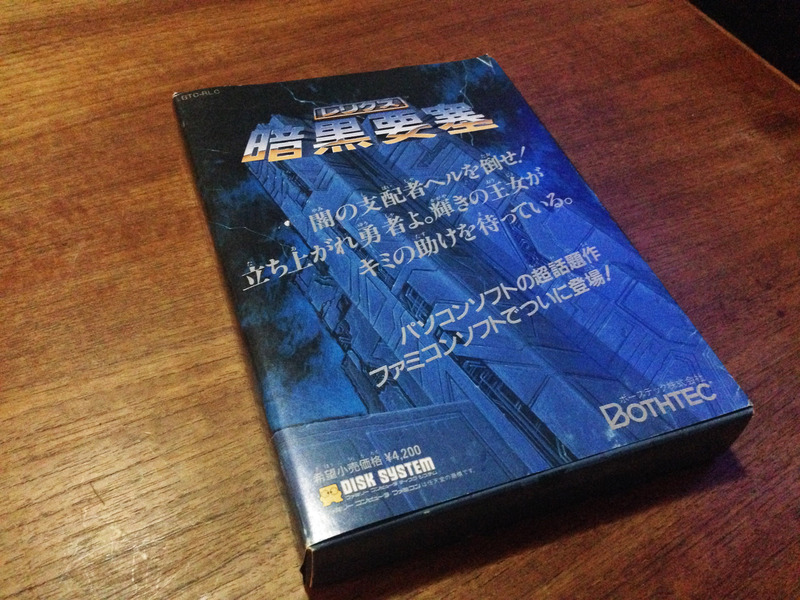 For classy packaging, it’s pretty hard to go past Bothtec’s Relics: Ankoku Yōsai. 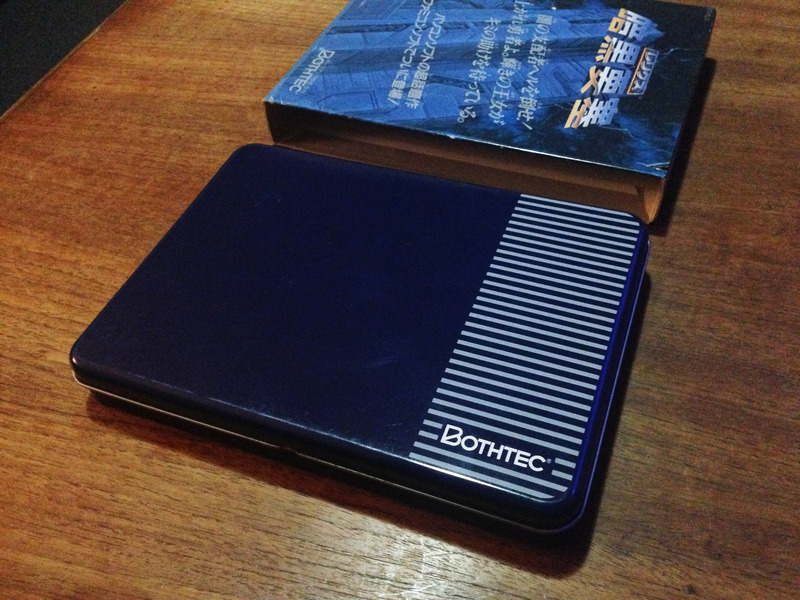 Inside the huge PC-game style outer slip is a metal case. 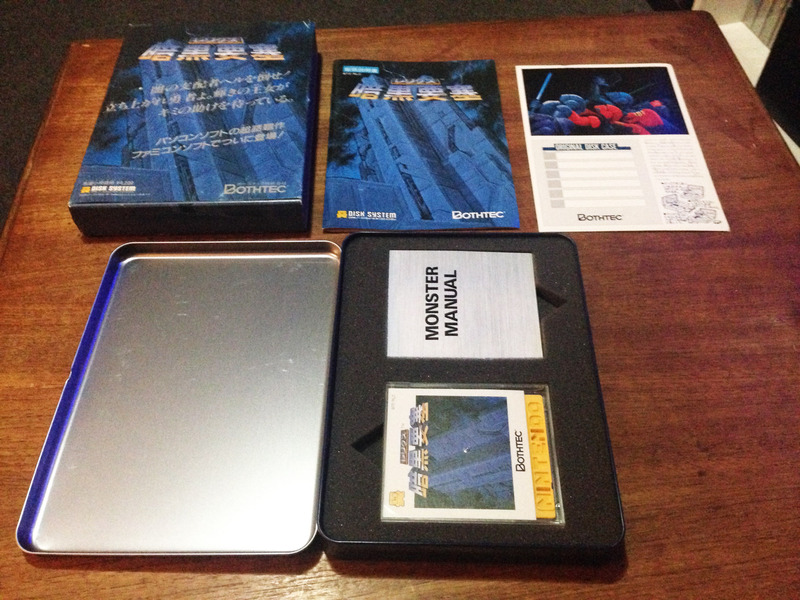 And inside the case, you have a large full colour manual, a sticker sheet, a disk-sized full colour monster manual, and the disk itself. 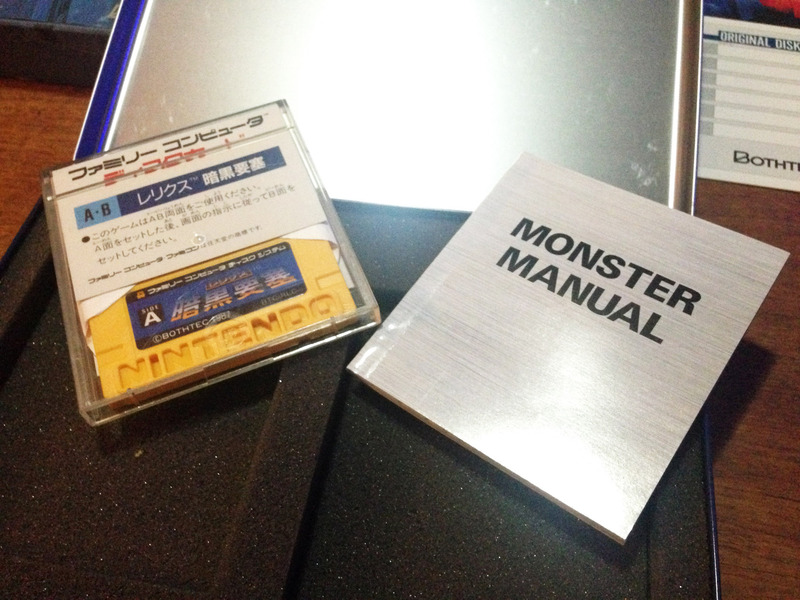 The disk case and monster manual fit inside foam slots, presented as valuable items. 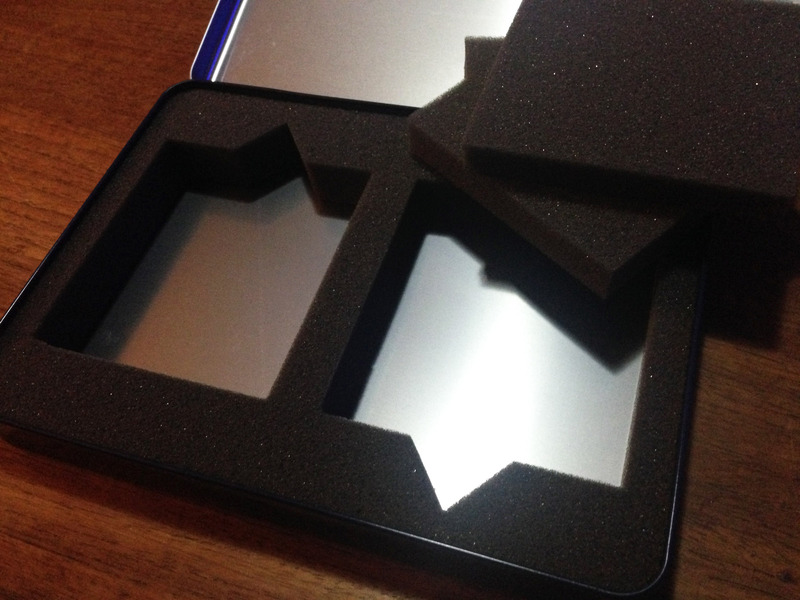 The case allows removal of some of the foam, so if you want you can use the metal case to store 4-6 FDS games in style. 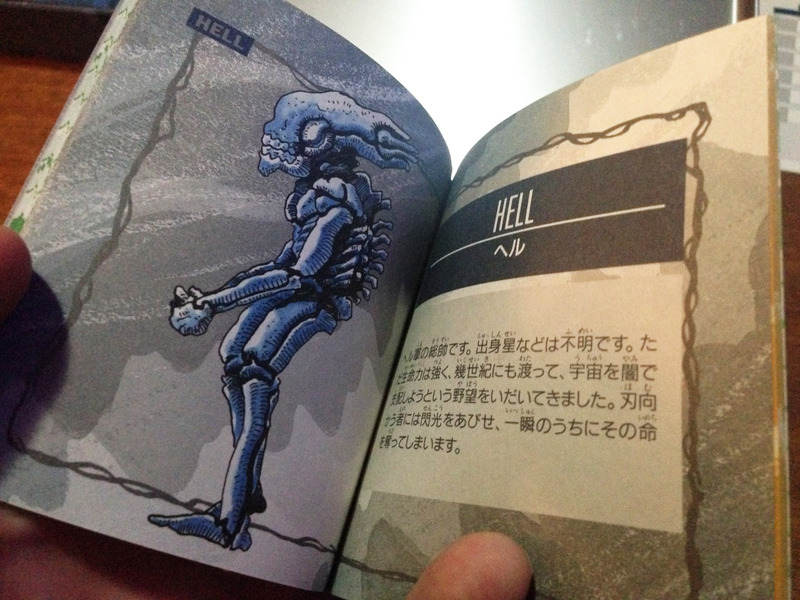 The monster manual gives every character in the game in a two page spread. 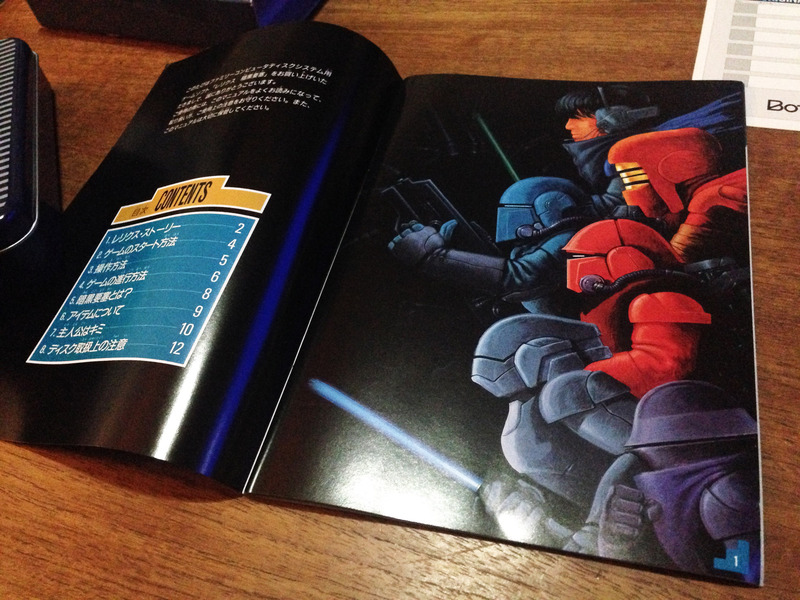 And the large manual is even nicer. Beautiful artwork is used throughout the presentation, and it does its job of making you excited to get into the game. 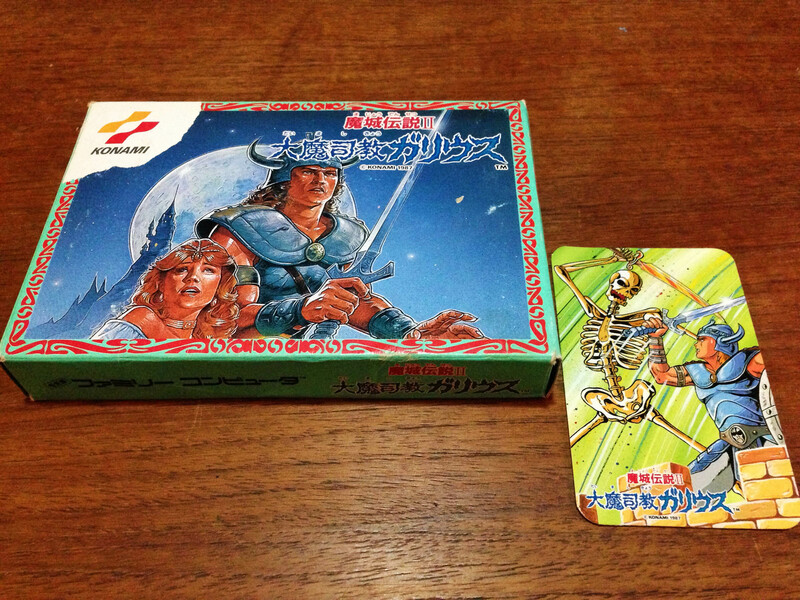 The game itself is almost as ambitious as the packaging. 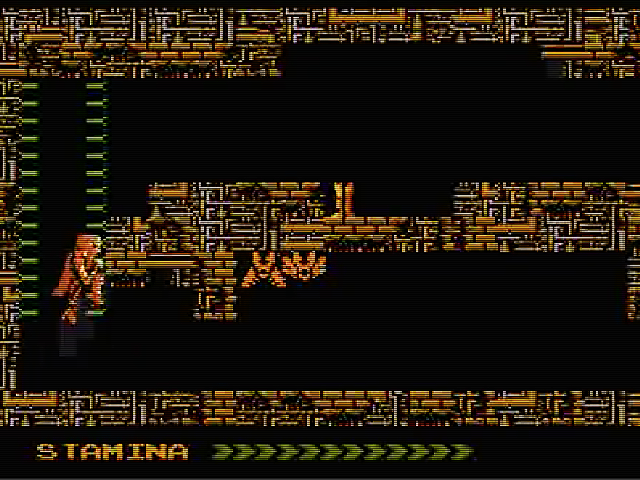 A Metroid-style sprawling action-adventure, it features huge sprites (for the time), large environments and a huge list of enemies and items. Set in a post-apocalytic world where dark forces have enslaved humanity, in the game you play as some kind of robot spirit guy who can possess the bodies of the dead. You must defeat all the enemies in a ‘sun fortress’ to free the good spirits (as well as the ubiquitous princess) to save humanity. The graphics are pretty good for the time, and the music is catchy. 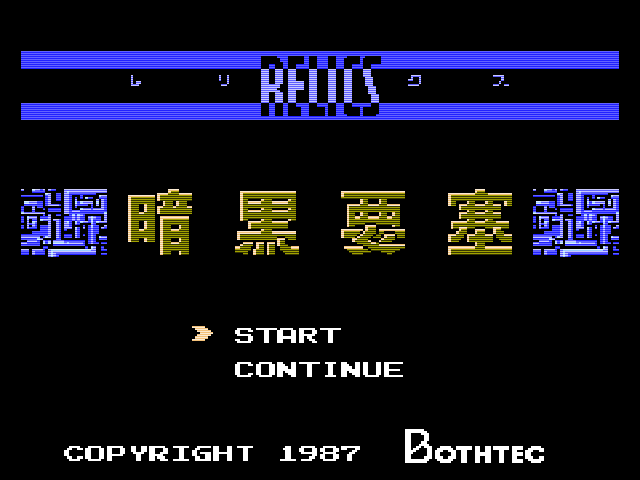 Despite the immediately noticeably clunky controls, it is not hard to be impressed early on, as the world of Relics is intriguing. Unfortunately the game doesn’t live up to its ambitions. 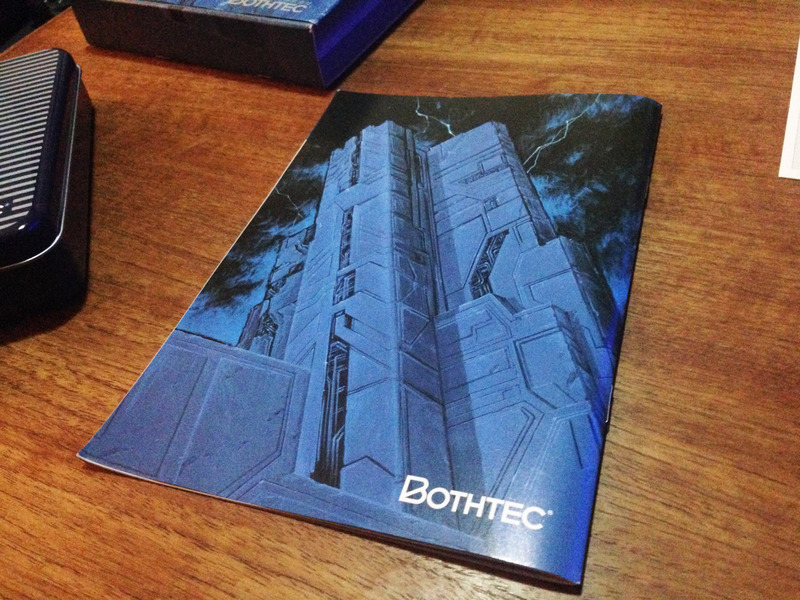 Bothtec’s roots were in PC games (including some predecessors to this game) and it Relics plays very much like a home computer game of this type, it’s quite rough around the edges. 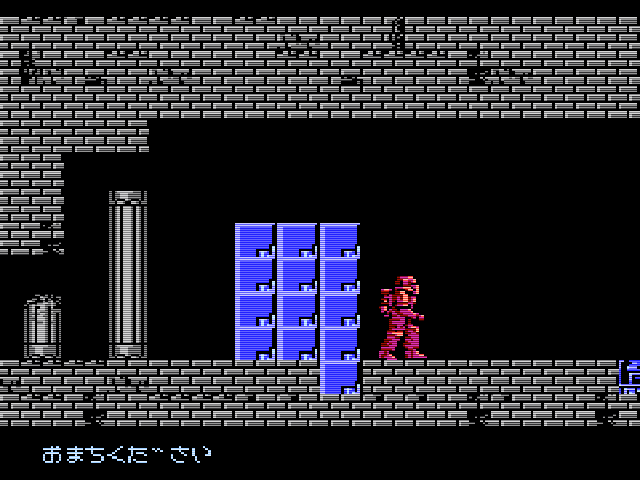 Controls are not only clunky but glitchy, and it’s very very difficult to outmanoeuvre many enemies. It gets better as you power up later on, but getting to that point is a huge slog. Worse than this are the load times. This game is always loading, I have not experienced any other FDS game like it. It does big loads every time you change screen, but there are small loads even within a loaded scrolling area when a new type of enemy appears. It’s really quite horrendous. 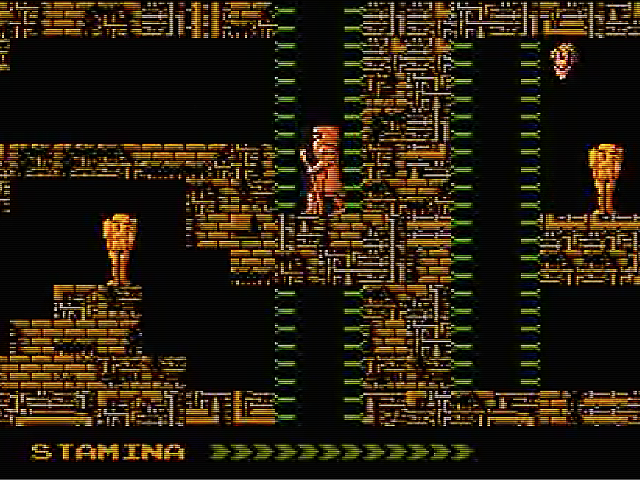 Despite these flaws, the adventure and exploring elements work quite decently in the traditional ‘try every direction in every order with every item’ classic 80s kind of way. Finding keys and power-ups in order to progress and remembering paths is always kind of fun when the world looks this mysterious, it’s just that it’s buried under layers of clunk. It still feels like a somewhat genuine retro experience, playing a game like this with the large manuals and packaging in front of you. But I wouldn’t recommend it for anyone except 80s adventure fetishists. 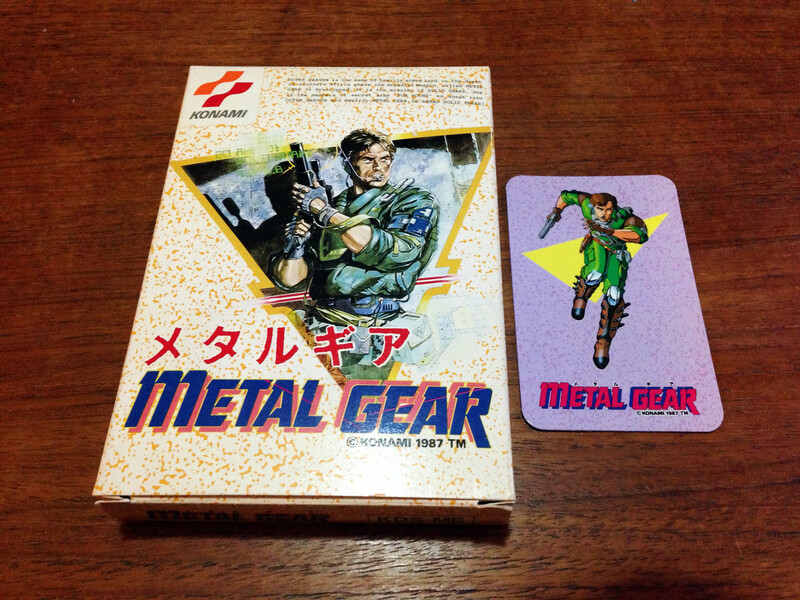 This is a follow up to a previous post on the Konami collector cards. After much searching, I have now almost completed the set! While there were multiple cards per title in some cases, I’ve only collected one per game. It seems unlikely I’ll ever get a complete copy of Exciting Boxing. It came in a huge box with a novelty inflatable controller, and commands insane prices online now. 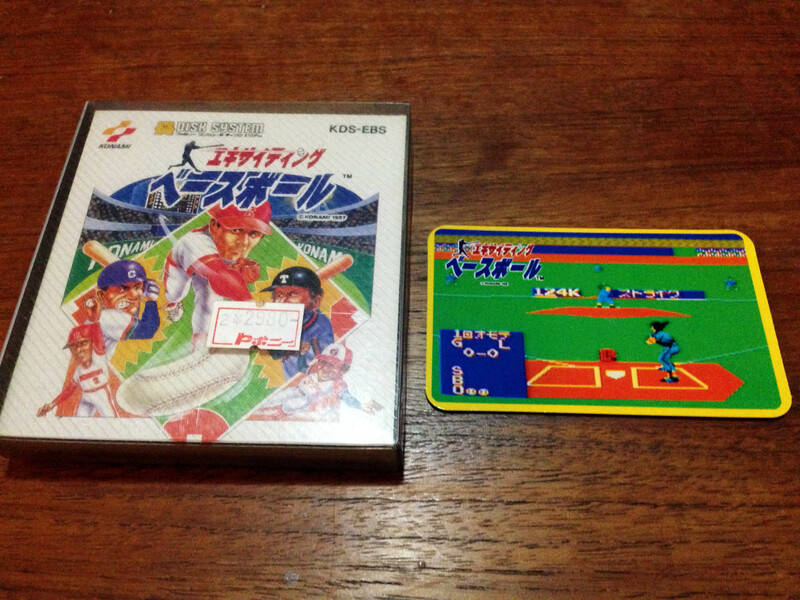 I managed to get the card for Exciting Boxing! 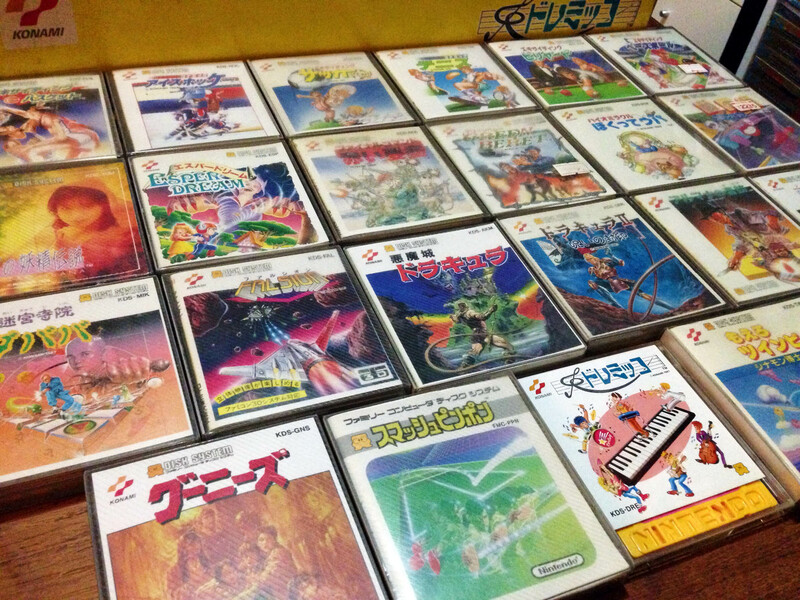 This is the full set of Konami Famicom Disk System games. 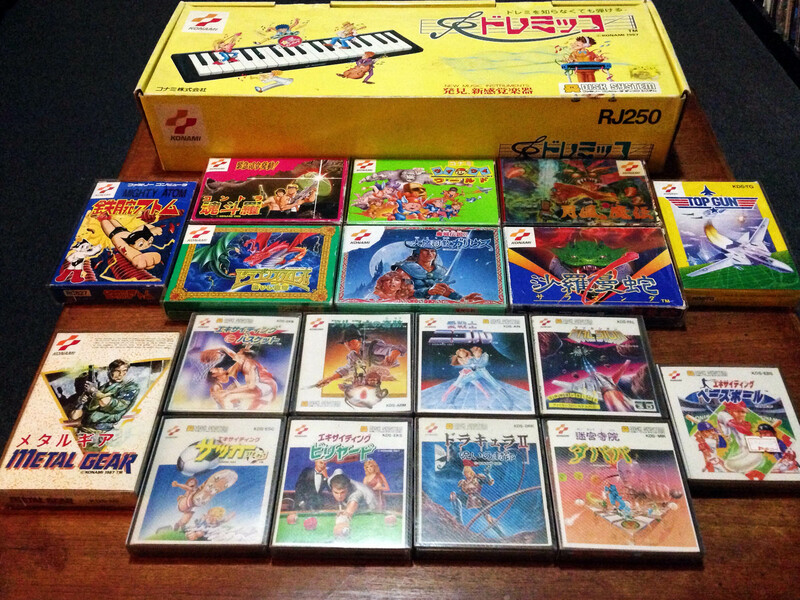 Up front you can see the two games I covered recently – Smash Ping Pong (which was published by Nintendo), and my custom designed Goonies/Twinbee ‘retail’ box, housing the official Disk Writer releases of those two games. 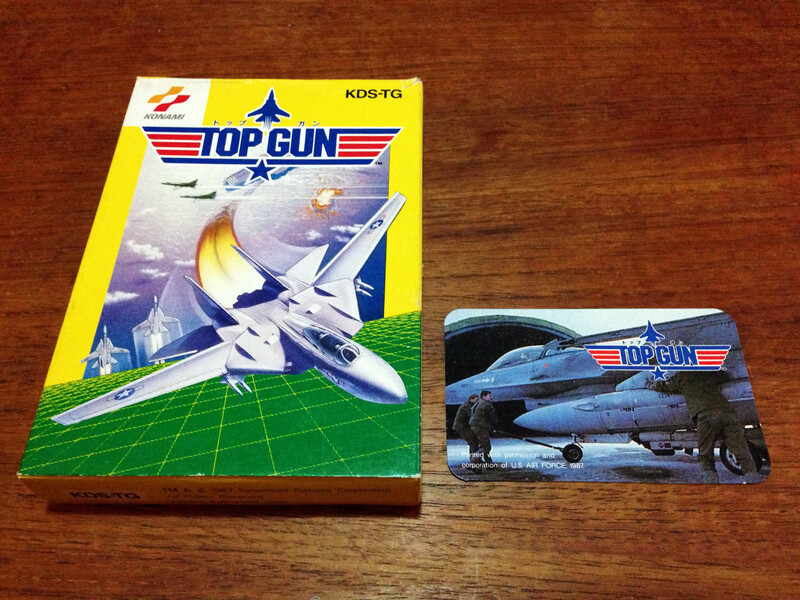 There’s also the DoReMikko box up the back, and disk at the front. 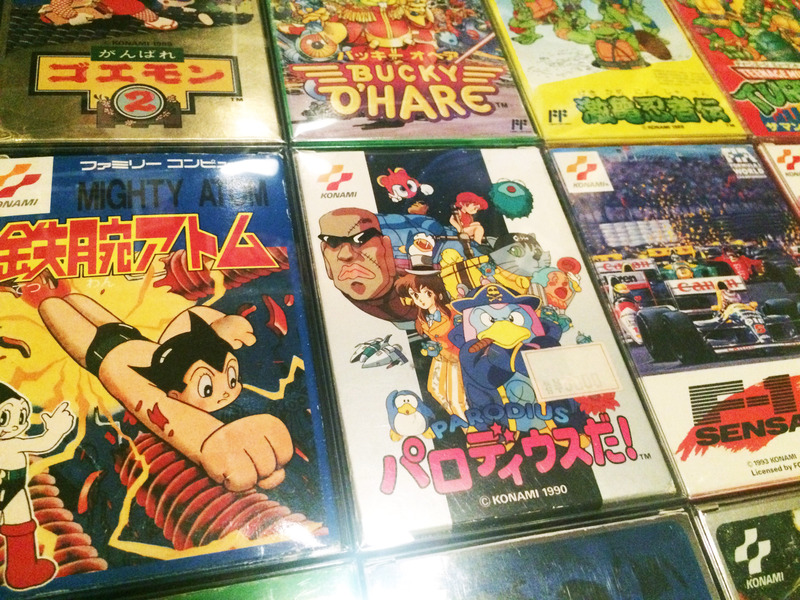 Some true classics here. There’s the obvious brilliance of Arumana no Kiseki, Akumajou Dracula, and Ai Senshai Nicol, and the awesome shooters Falsion and Gyruss. 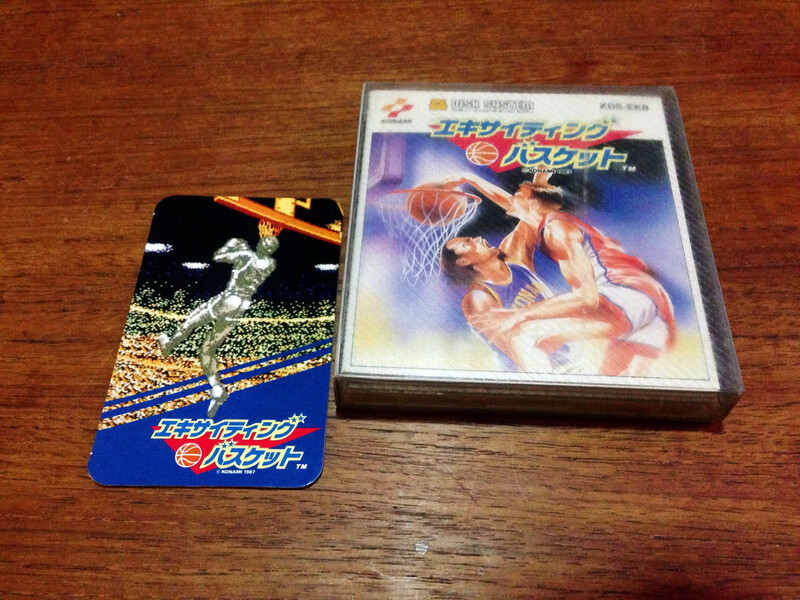 The sports games are top notch as well, I love Exciting Soccer and Konami Ice Hockey in particular, while Exciting Basketball has fantastic music missing from the NES version. 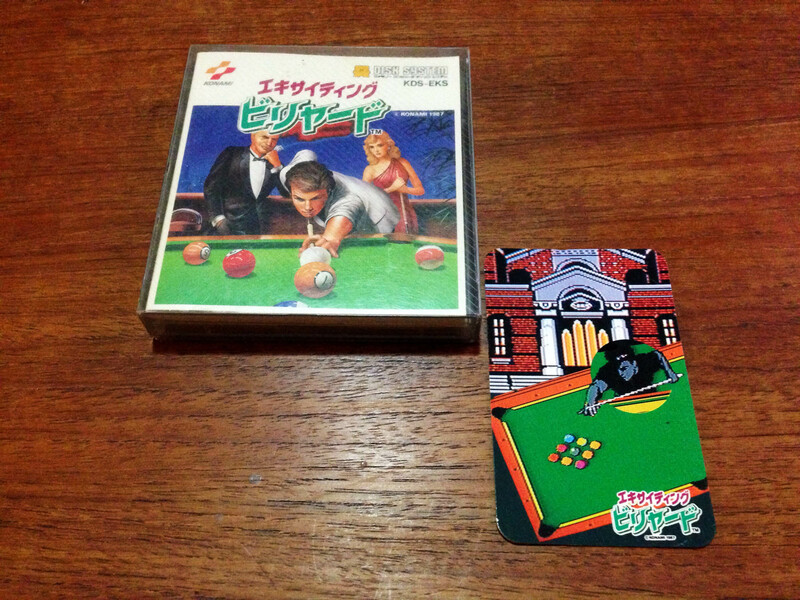 Exciting Baseball and Exciting Billiards are great too. 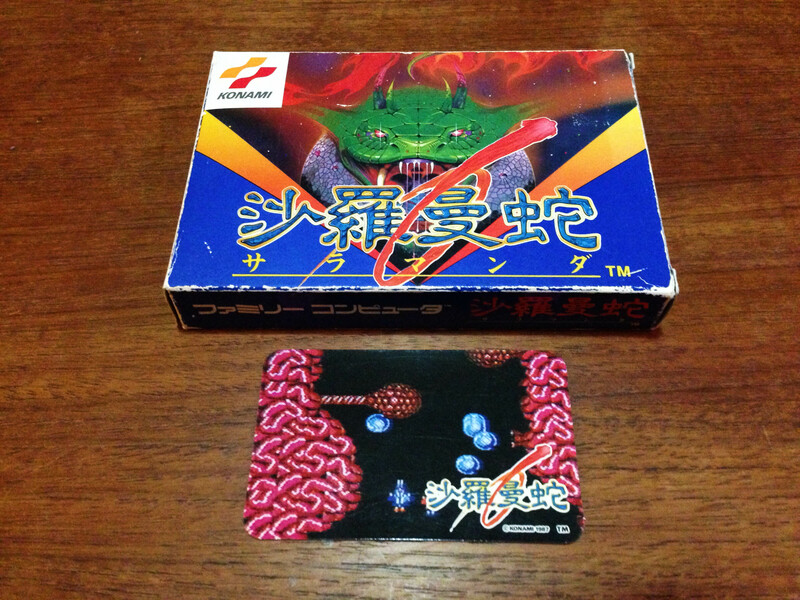 Really every game has its merits, from the cutesy platformer Bio Miracle Bokette Upa, the creative spin on the Breakout formula in Nazo no Kabe: Block-kuzushi, the alternative layout of NES Jeep shooter Jackal in Final Command, to the flawed but revolutionary Dracula II. 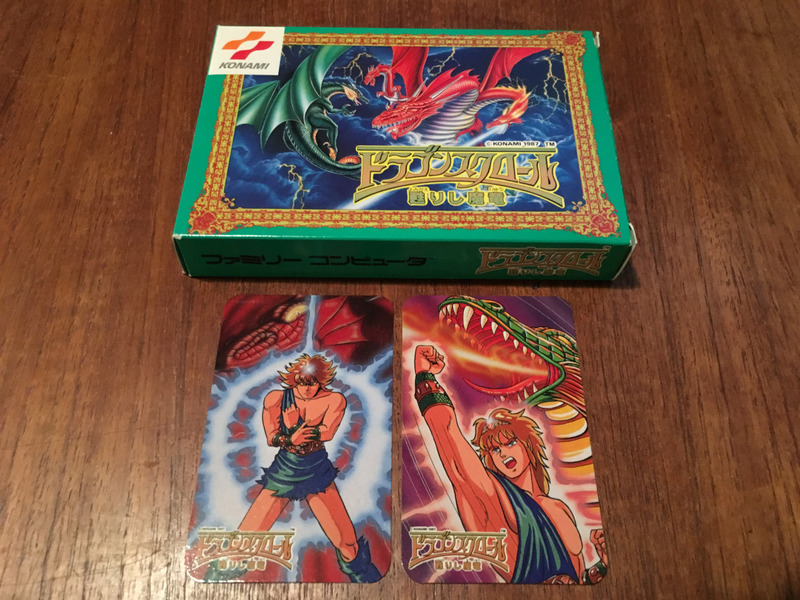 Konami. 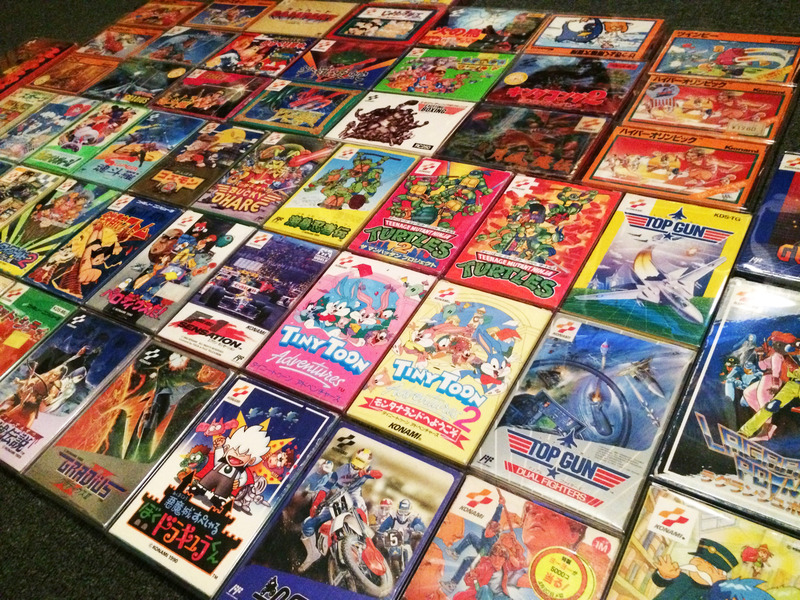 In the 80s and early 90s they were Nintendo’s equal.